I’ve been working on my dining nook for a while now, trying to bring it all together. It’s not much of a space: about five feet wide and twelve feet long, basically a glorified hallway between the front and back of the apartment. 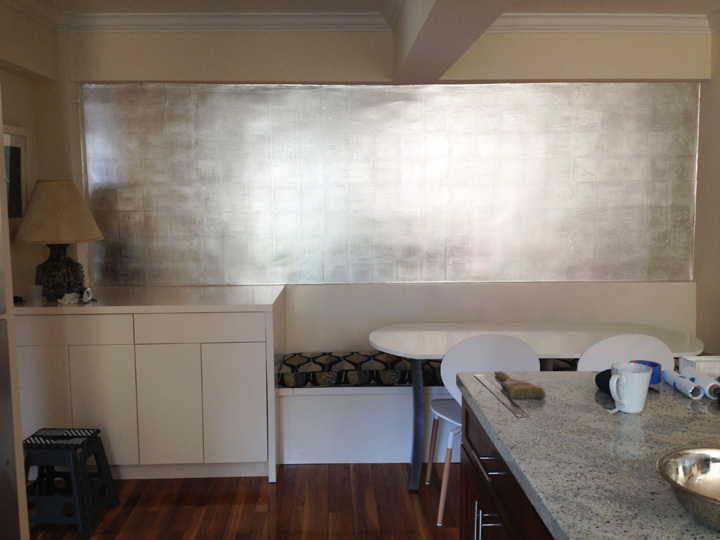 I decided to gild the wall with aluminum leaf. Why gild at all? It’s slow, smelly and incredibly messy. 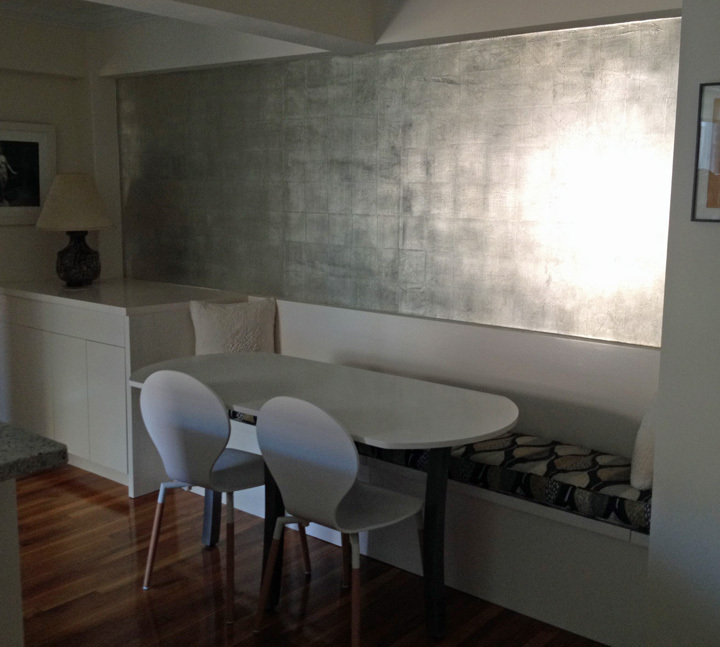 Here’s why: because it’s amazing what a difference a reflective surface can make. Plus it’s really fun! This is the darkest corner of the apartment. It gets eastern light in the morning, and once the sun moves, gloom descends. So I have to put something reflective on the wall to bring in light, and I’m not a big mirror gal. And the wall is a workable size, about 4 feet tall, manageable by myself. 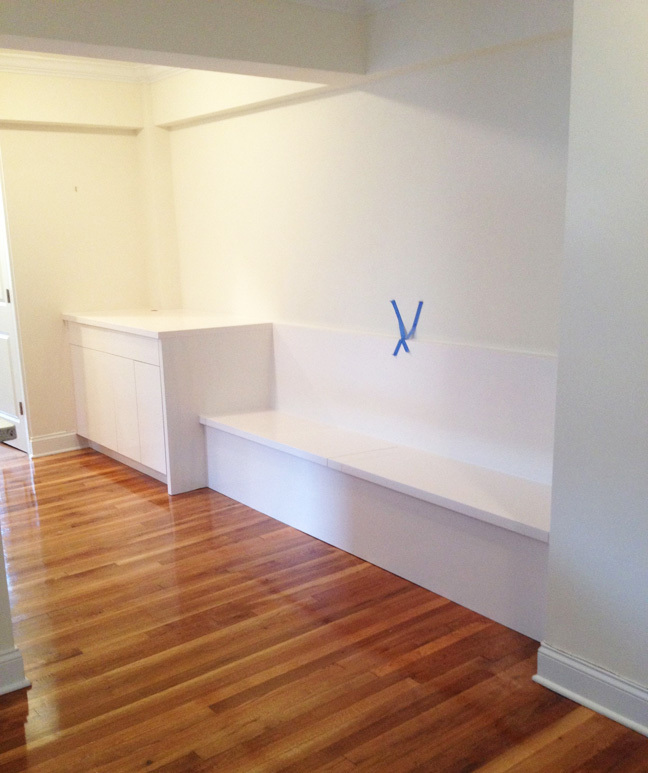 Here’s what I started with, a freshly installed banquette bench with cabinetry and a very white wall. 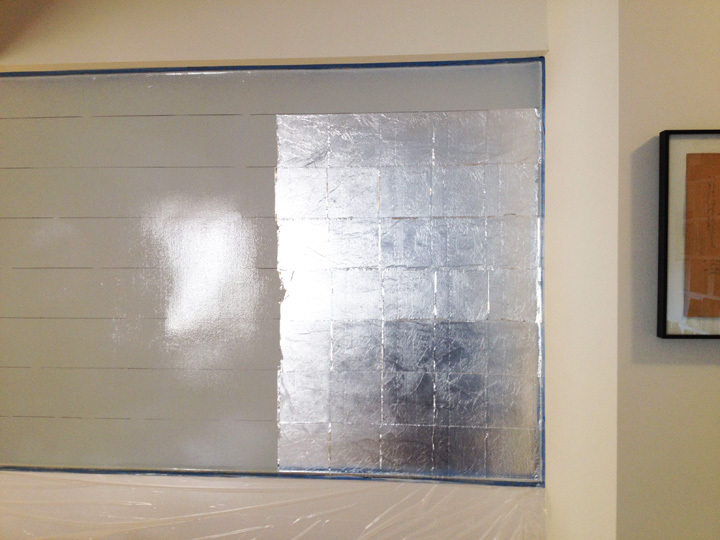 First step, prep: protect everything with plastic, tape out the wall with low-tack tape, then base coat in an oil-based light grey, similar to the tone of the aluminum leaf. 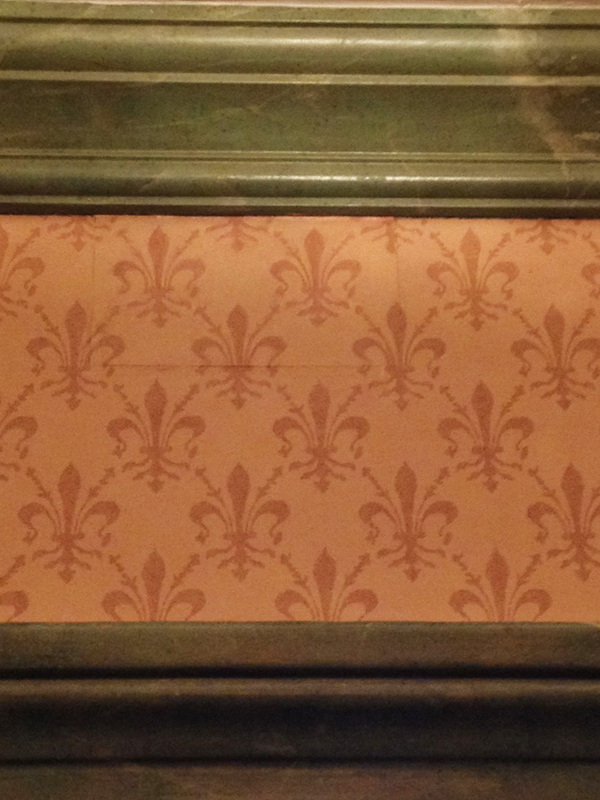 The trickiest part of gilding is staying level and square. Drawing parallel lines on the surface with a sharpie lets me know where the leaf should go. The lines are 6 inches apart because that’s the width of the leaf. 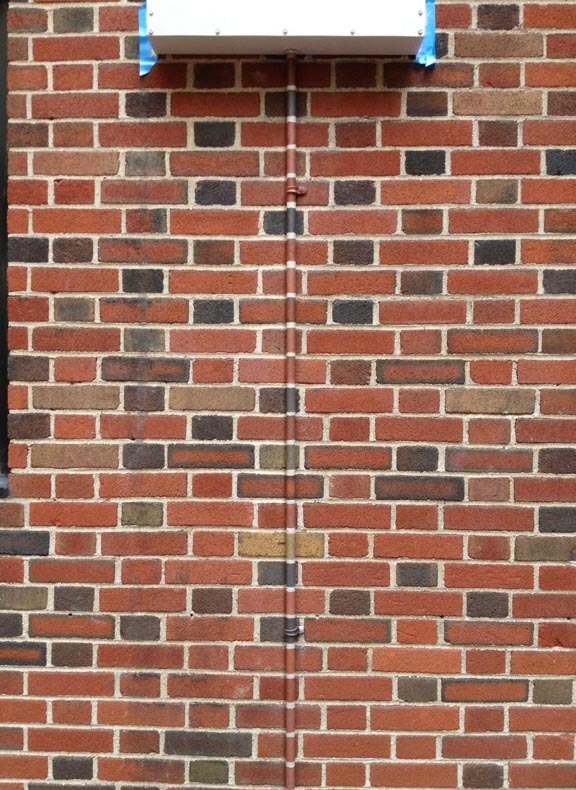 The leaf is stuck to the wall using oil size, a type of glue. 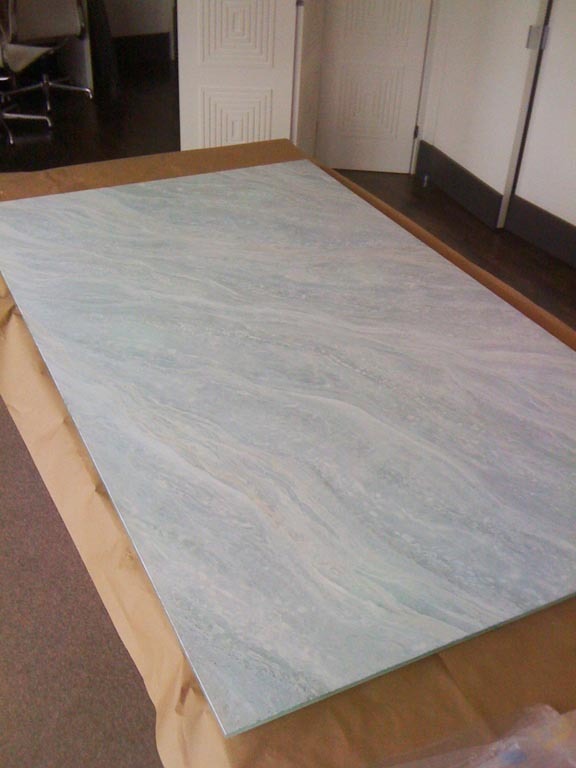 The size is rolled on with a regular paint roller, then brushed out with a natural bristle brush. It has to come up to the correct tack before the leaf can be applied, which takes about 90 minutes, depending on how much it’s been diluted. 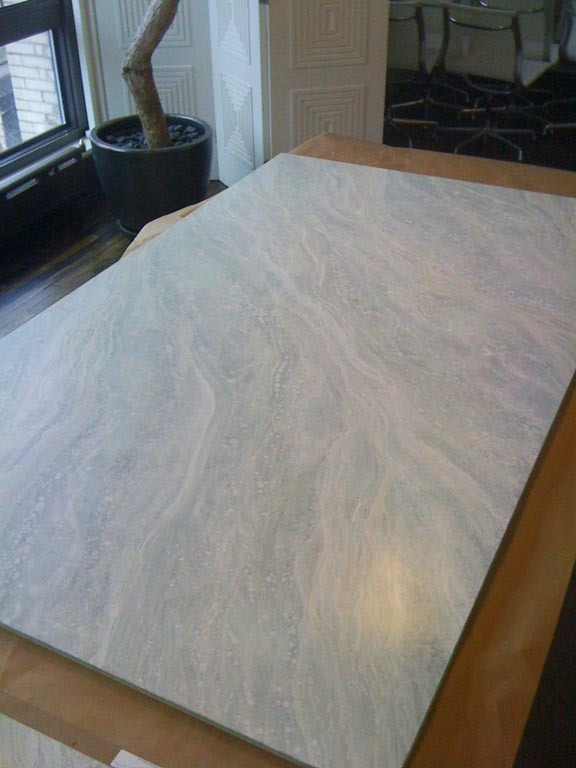 The surface is workable for several hours. I’m using rolls of ribbon leaf, cut into sections five squares wide. 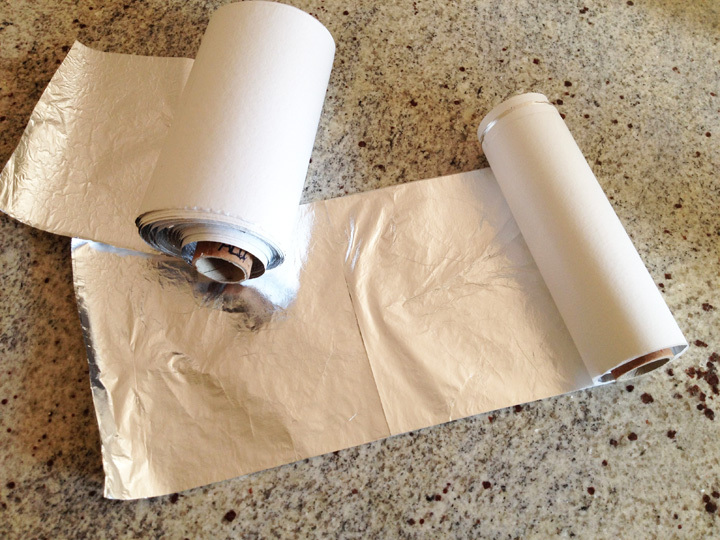 Gilding with individual leaves would take forever; this makes the job much easier and creates better results. And then it’s time to start gilding, from bottom to top and right to left. From the bottom so leaf doesn’t fall onto the sized surface, and from the right because mistakes will be made at the beginning. Each leaf overlaps the next one by 1/8 of an inch. So when the wall is done, all of that overlap is fluttering in the breeze. 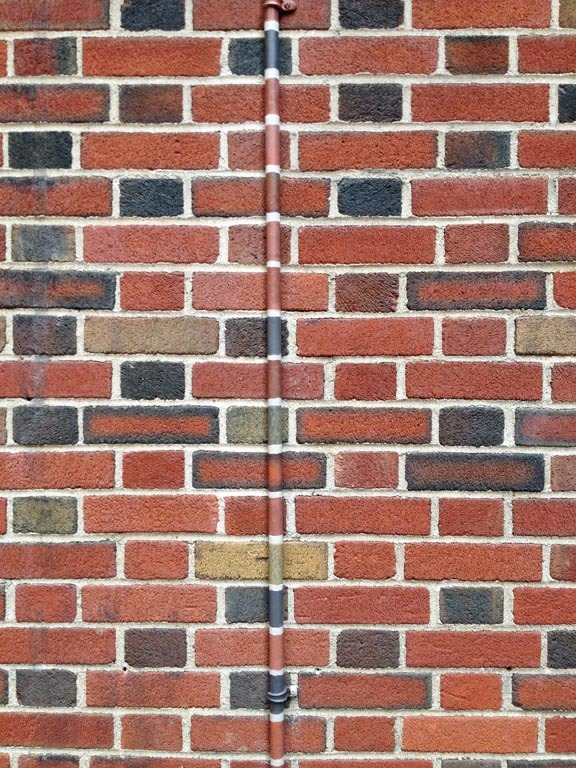 Once the wall has dried overnight, the overlap is cleaned off with a soft brush, which creates a huge mess, tiny bits of leaf floating off in all directions. Below is the completed wall. 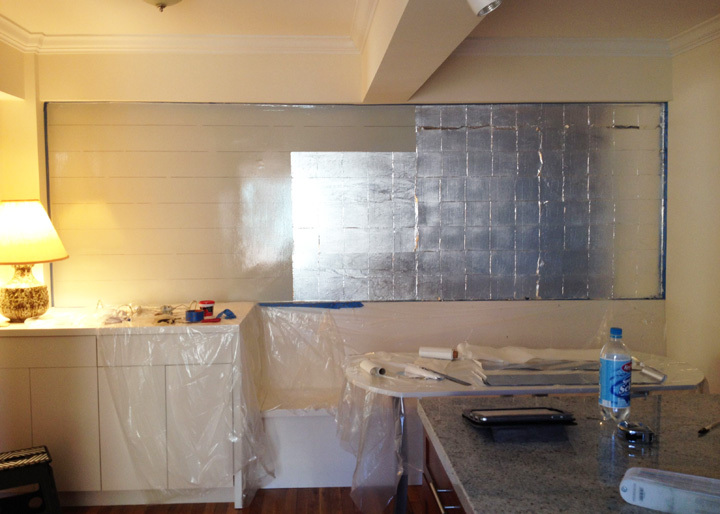 As the photos above progress, you can see the light leaving the room as the morning sun moves to the south. I turned off the lights to show how much the leaf reflects indirect light. So here we are with everything back in place. Tons of light, right? And the wall changes as the light changes. What a difference. 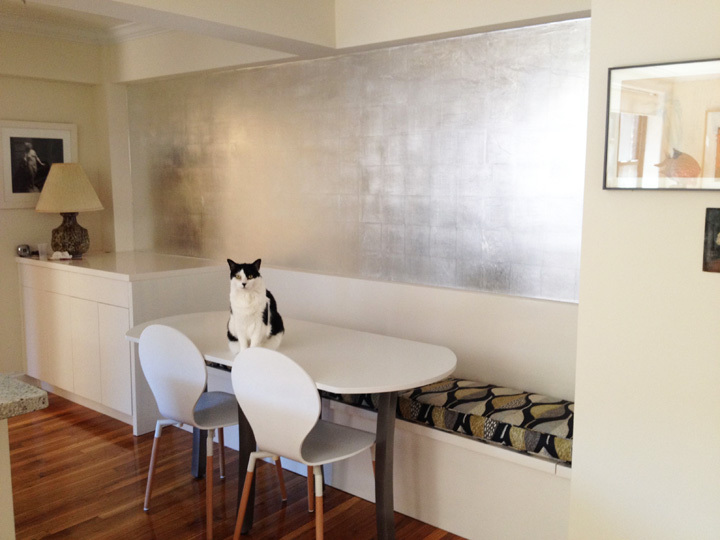 But I’m not done; aluminum looks very cold and hard, and I don’t want the dining nook to feel chilly. 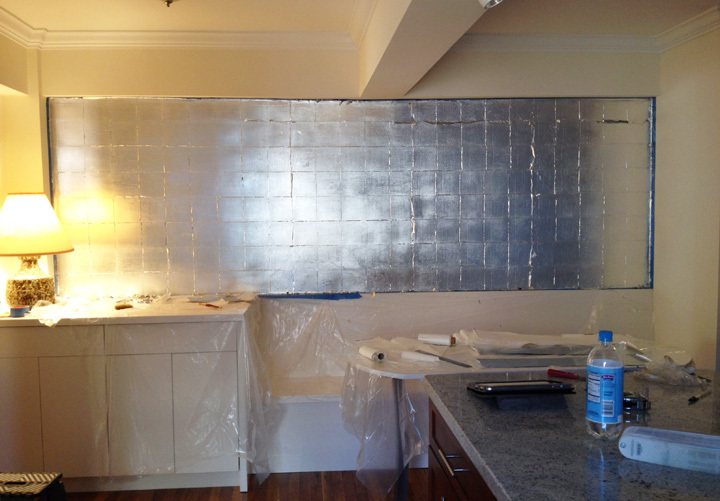 The wall needs an overglaze to knock back the reflection and warm it up. 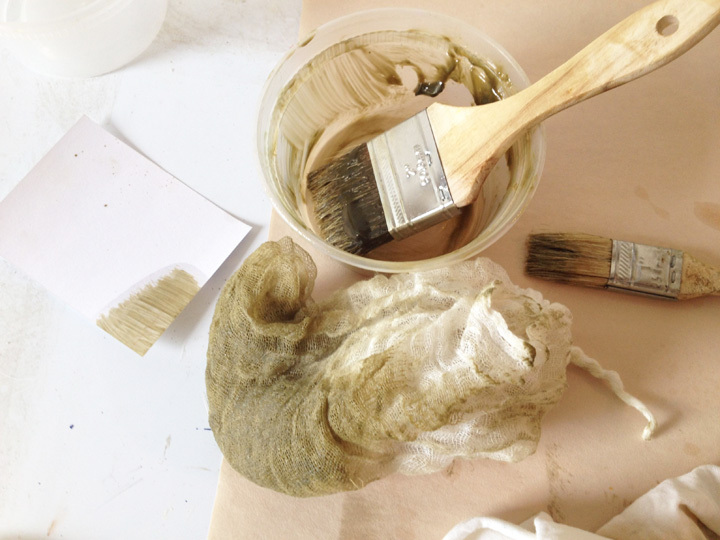 To coordinate with the green in the bench cushions, I mixed a dirty green. Green is one of those colors that can read as cold or warm, depending on what it’s next to, since it’s a mix of blue and yellow, cold and warm. 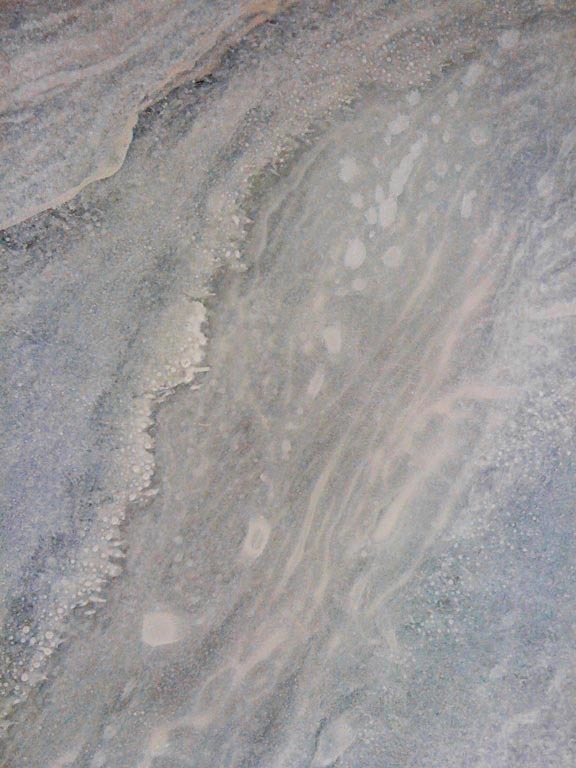 The glaze is made with Windsor and Newton Liquin mixed with tube oil colors. 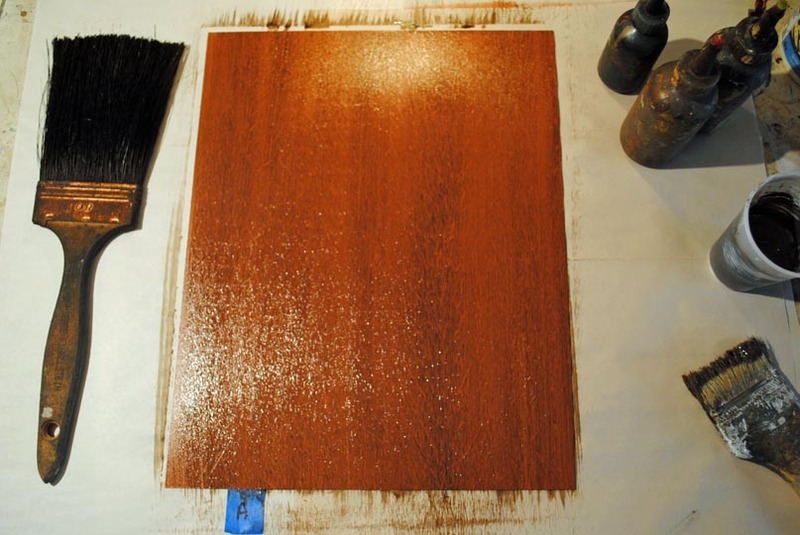 Liquin is an oil-based medium used to speed drying time, and it’s the only medium I know that stays translucent over gilding. The glaze is applied with a chip brush and gently pounced with cheesecloth to give it a bit of texture. Even though the green seems really strong as it goes on, it ends up looking subtle. 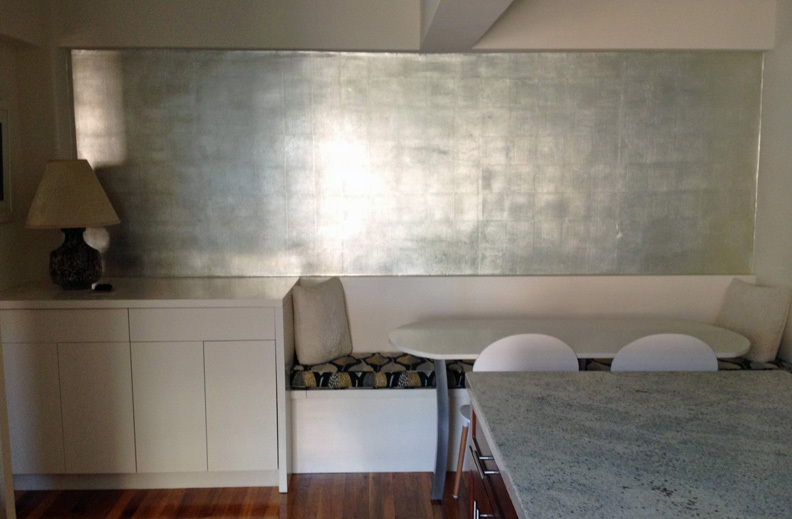 The refection of the leaf is no longer glaring, although it still softly reflects, the tone is warmer and now the wall is visually integrated with the dining nook’s palette. A couple of shots of the finished wall with the lights off in the late afternoon. The light from the window across the room now bounces off of the leaf. Before and after. 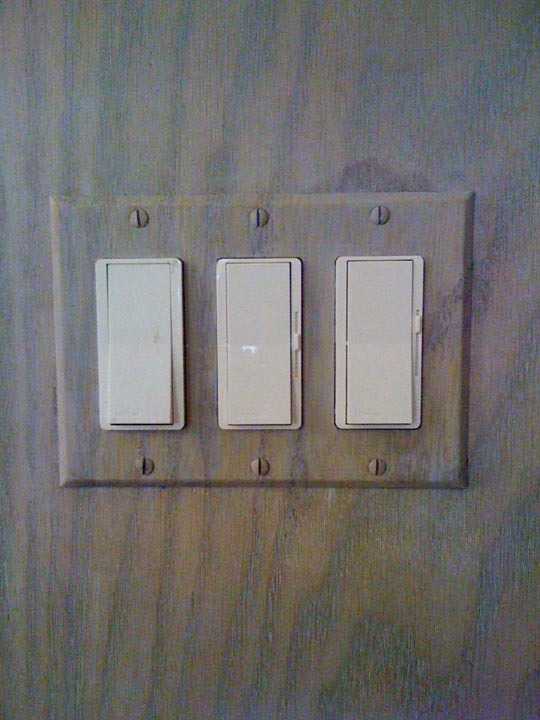 Still waiting for my light fixture to arrive. The table is custom made and I love it. That’s a story for another day! Here’s a quick little post about all of the color matching I’ve been up to these days. I love these projects; some are very challenging and others are pure play. I also end up jumping all over town, which is fun. 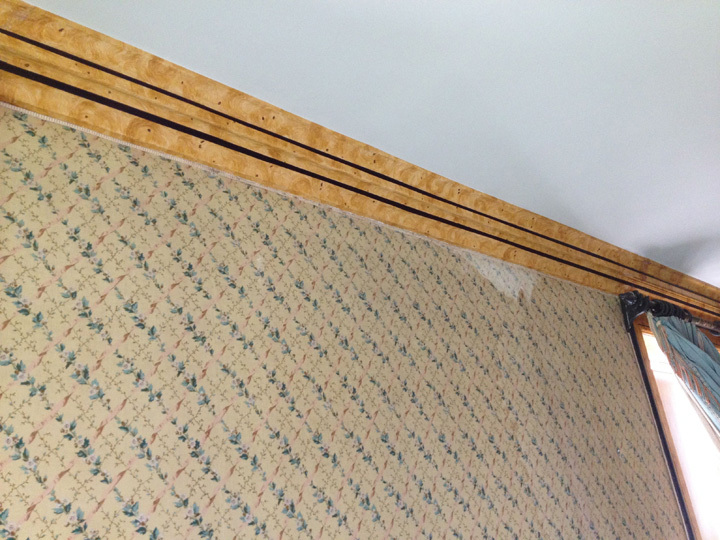 We’ll start off on Sutton Place on the East Side with a damaged crown molding in a bedroom. It was originally painted as a faux wood burl. 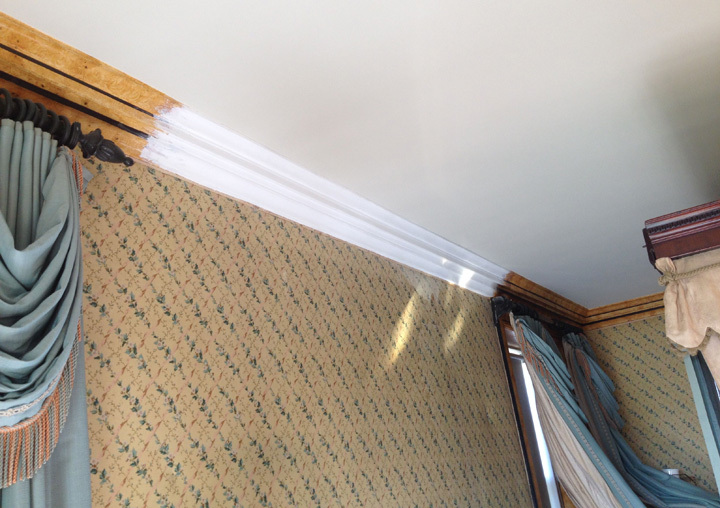 Water damage wiped out a long section over the bed between two windows. 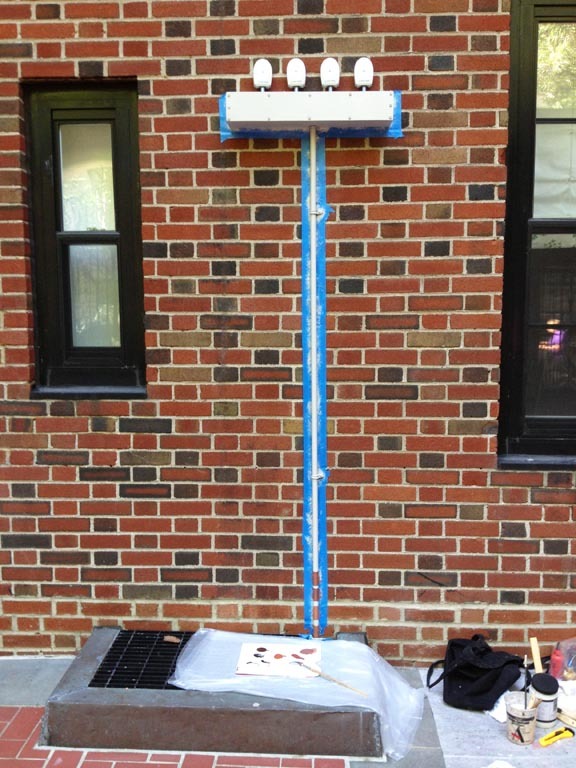 Here’s the repaired area, just primed. This is the final finish. It took about five hours to base coat, glaze three times, then paint in the black lines. You can still see the water damage on the fabric-covered wall. 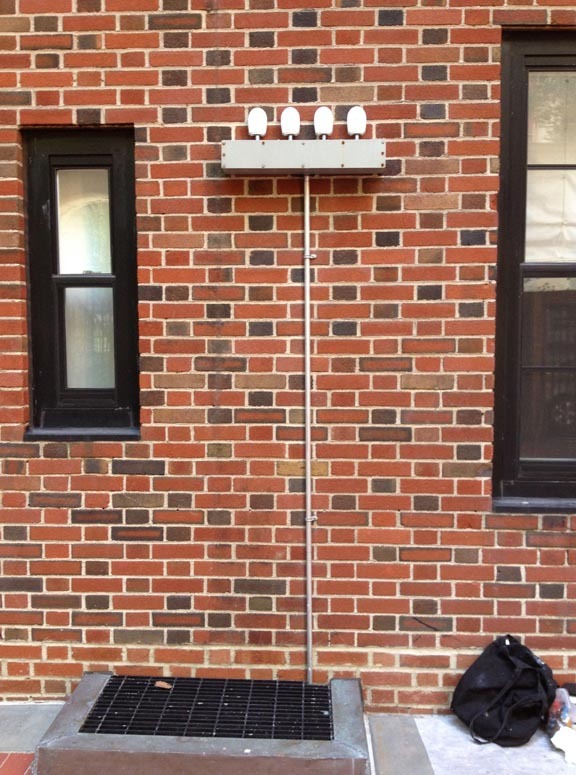 Next up are a couple of thermostat heat sensors on the Upper West Side. 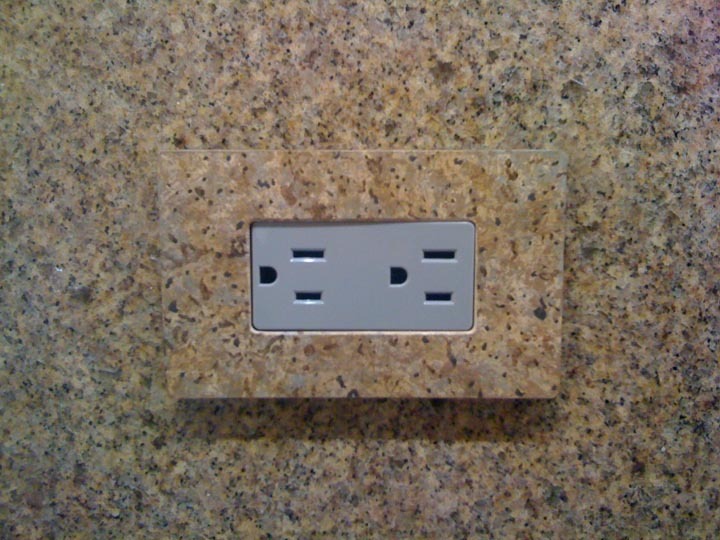 These are placed on walls and are about 1-1/2 inches wide. They usually stick out like sore thumbs. 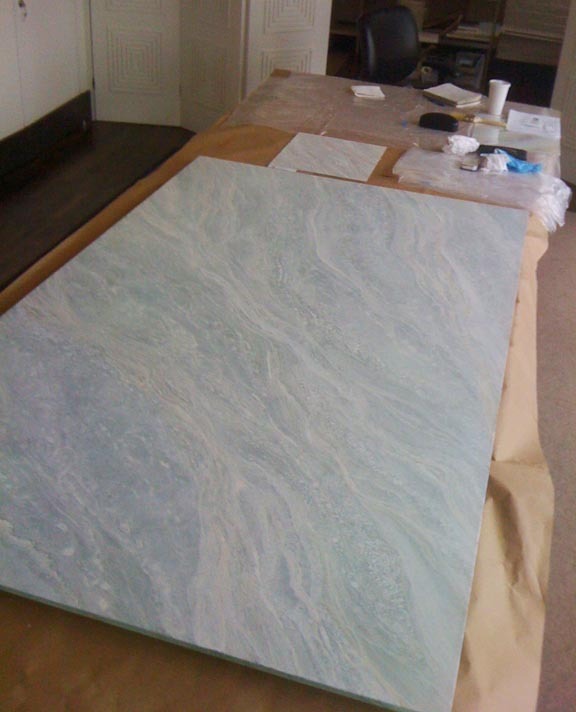 This first one is painted to match a wall upholstered in a velvet fabric with a recessed pattern in a contrasting color. Tricky. The next one is on a sisal wall covering. The colors look off in the photo, but match in person. The best part of this one was trying to create a three-dimensional trompe l’oeil effect on such a tiny scale. 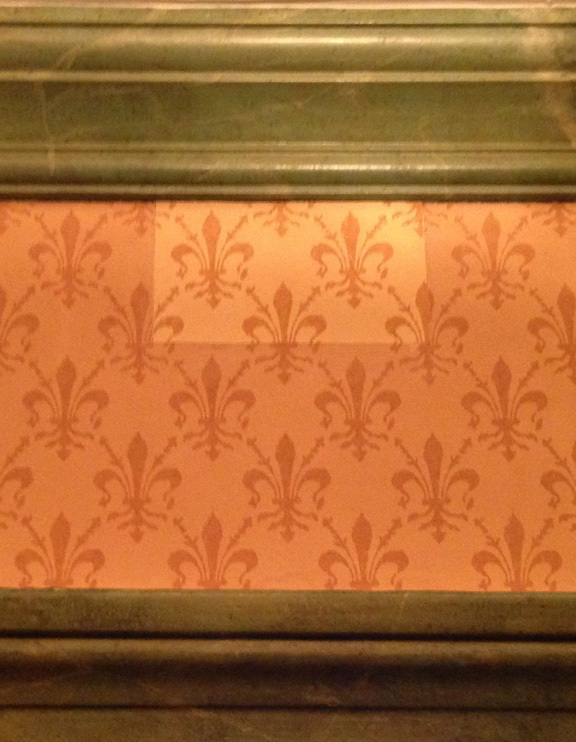 Below is another wallpaper, a mini tragedy to a home owner on the Upper East Side. The paper was damaged and a new portion was cut in. Unfortunately, the reserve roll didn’t match the paper on the wall. 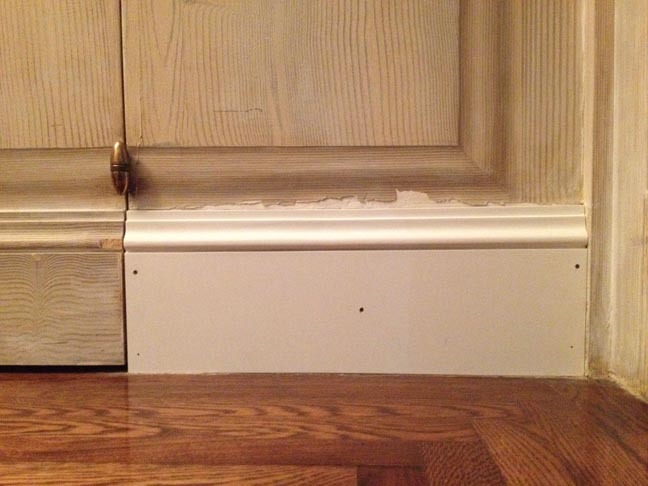 This area is about 4 x 6 inches, between a crown molding and the top of a door frame. I was able to paint it to match by carefully layering on color, but there was no way to hide the cut lines. 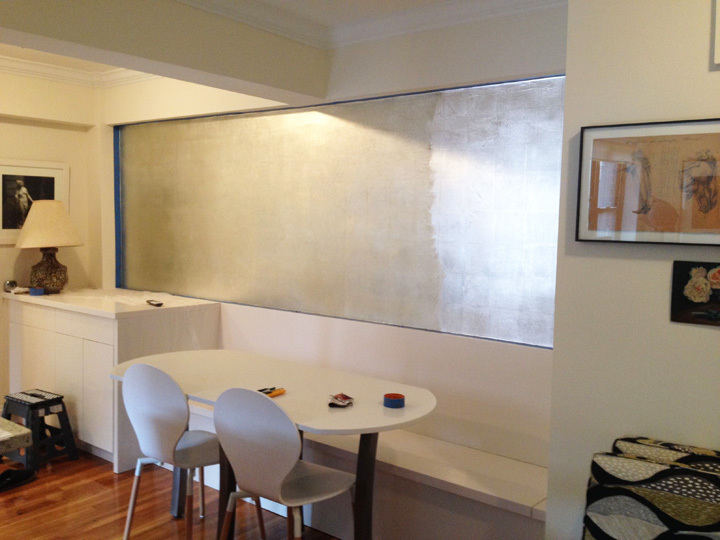 The client was not happy, but there are some things I can’t do with paint and erasing cut lines is one of them. Now we’re getting into the really fun stuff. 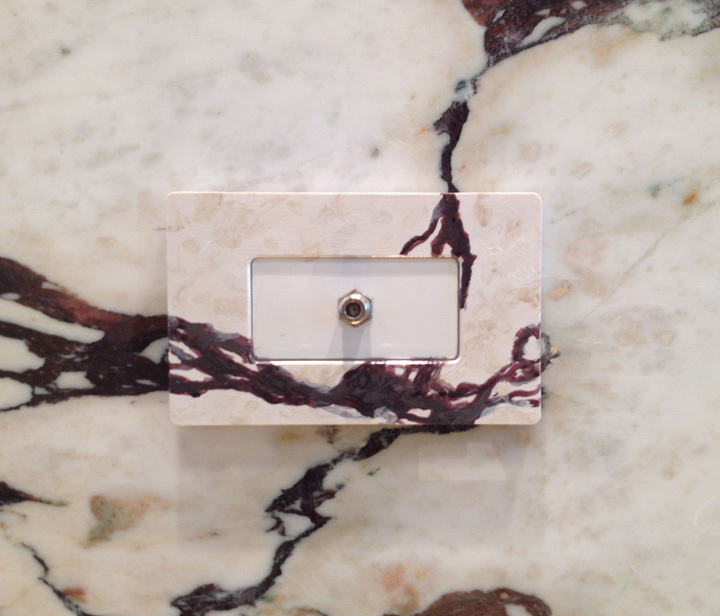 This violet marble is spectacular; it clads every surface in a tiny powder room. For some reason it was really easy to match, a total blast. 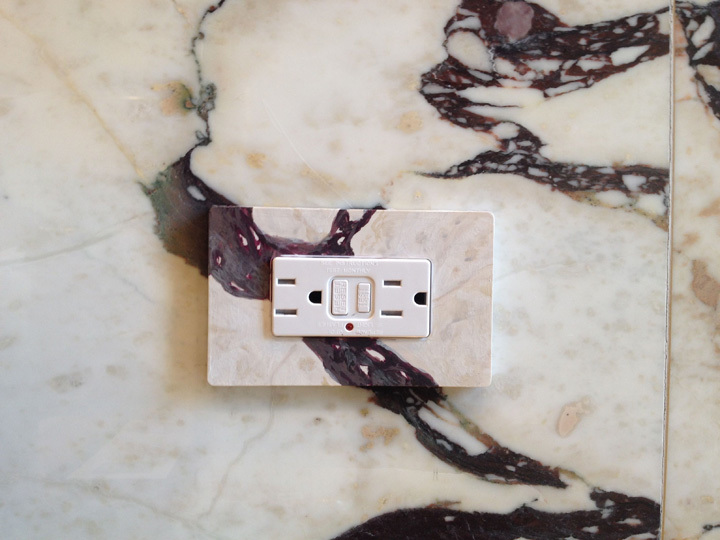 In case you ever have to match this marble, here’s the skinny: Permanent Violet Dark combined with Red Oxide and Black. 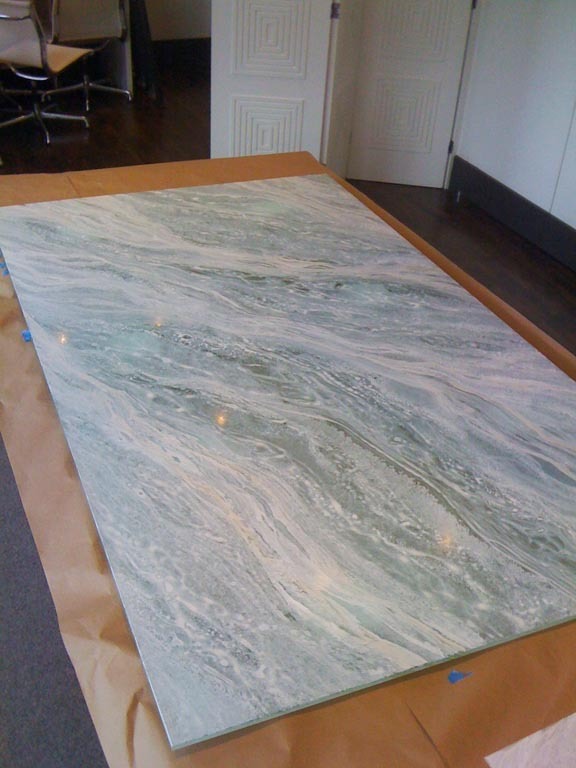 The same marble was also used in the apartment’s kitchen. Just for fun, here’s the view from this apartment’s living room. 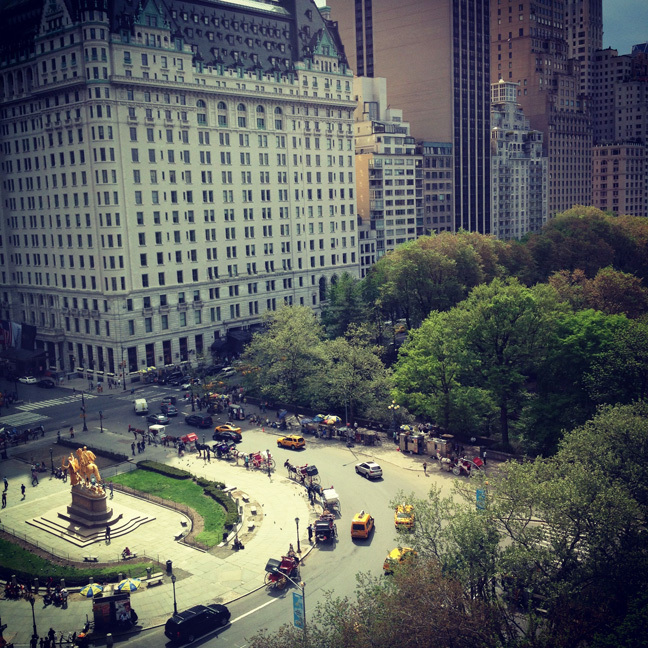 That’s the Plaza Hotel, perched on the edge of Central Park. 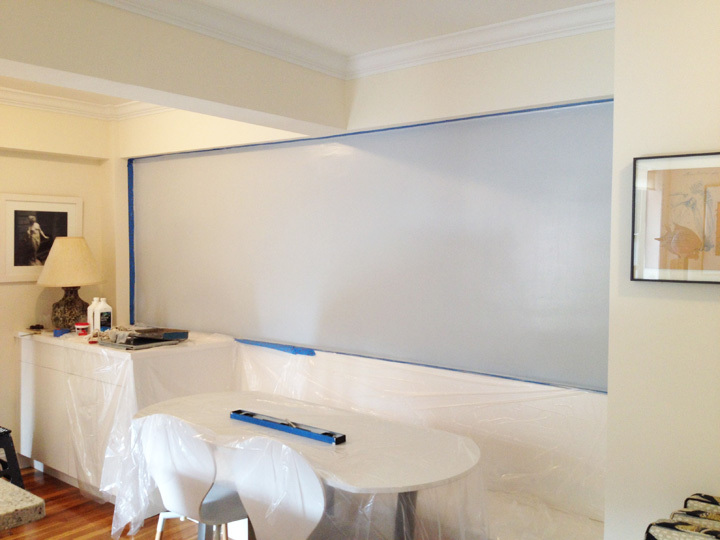 And we’ll finish up on the Upper East Side again, in the bar area of a brand new apartment renovation. 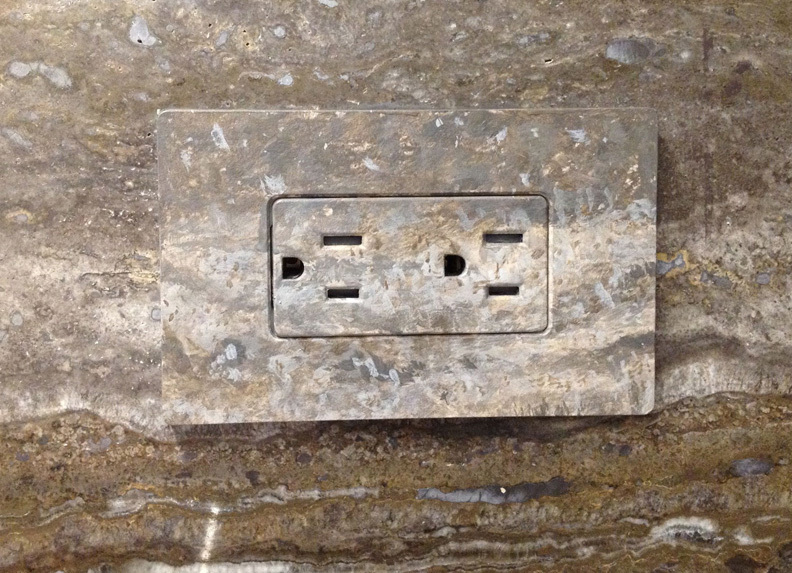 Usually when I paint outlet covers, I’m asked to leave the center plug section unpainted because the paint will scratch off eventually with a lot of plugs going in and out. 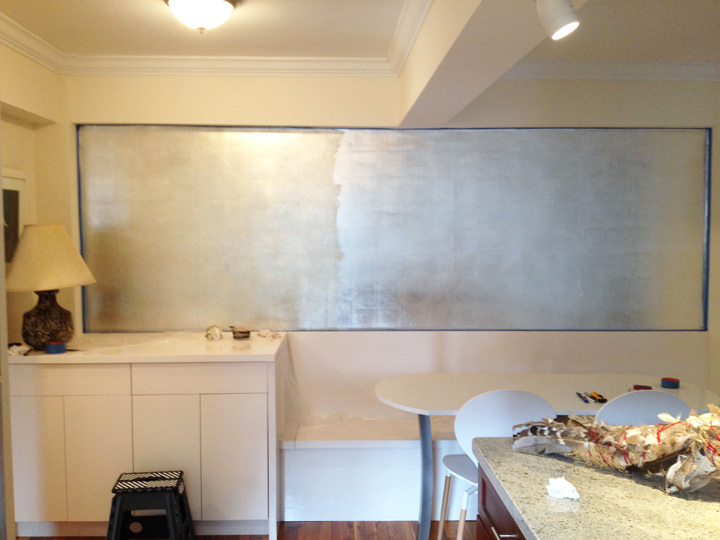 In this case, though, the designer asked me to paint the whole thing, and it let me create a vanishing act. 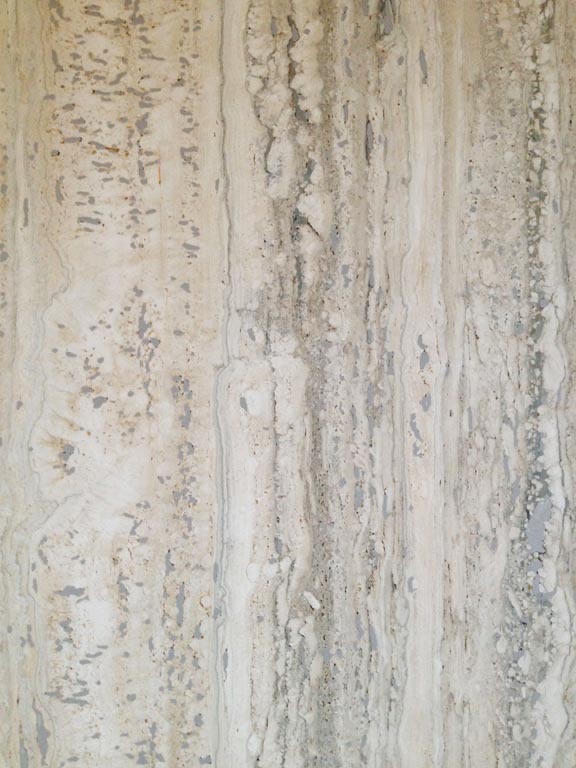 Love this brown travertine marble. Where’s the plug? That’s it for now. Happy weekend, everyone! Hi everyone, I’m sorry that I’ve been silent for a few months. Between work, fixing up my new apartment and trying to find photographic inspiration, I was completely distracted. But things are calming down again. So, what’s happened in the meantime? In January, I traveled to Little Rock, Arkansas for a glazing job. On our last day, we stopped by the Central Arkansas Nature Center. Ironically, almost all of the nature inside was dead and stuffed, and an exhibit about native wildlife attributed the destruction of the great buffalo herds in the 19th century to loss of habitat. 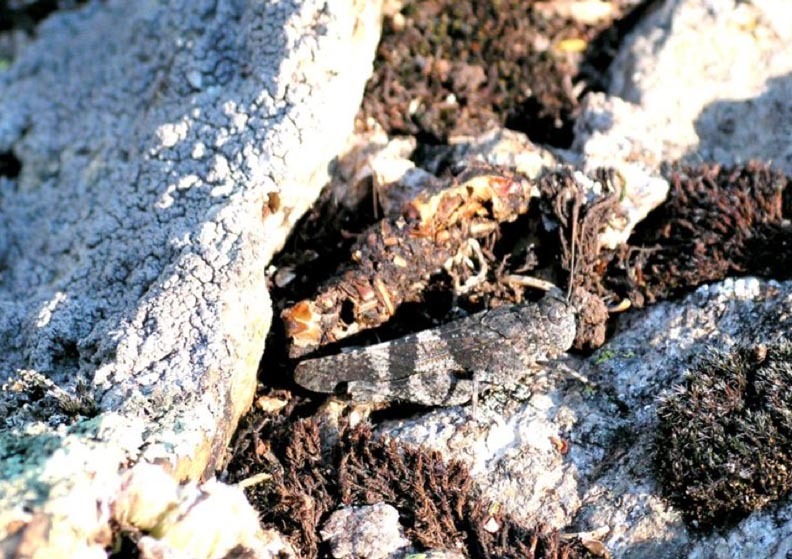 Loss of habitat? Not proliferation of bullets? 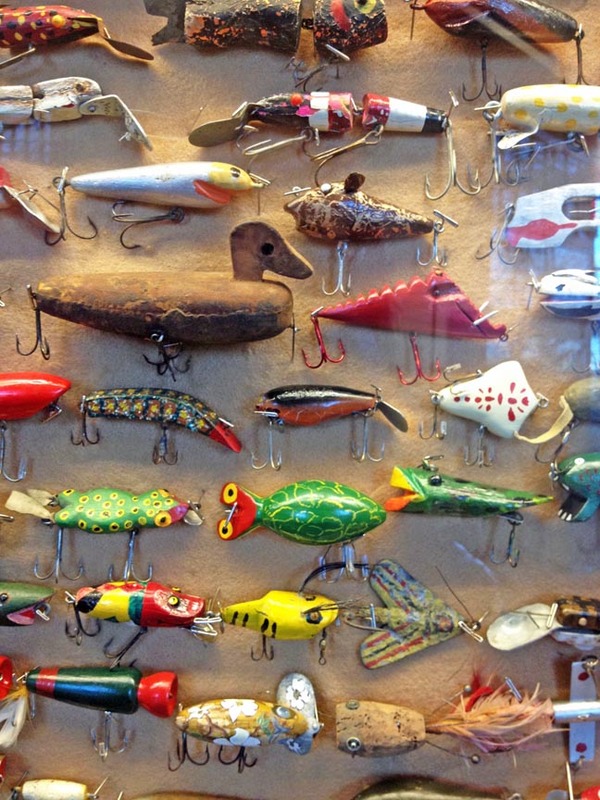 However, we did see a great exhibit of fishing lures. Some were handmade, others not, but all were beautiful and the inventiveness and playfulness of the lure designs was amazing. 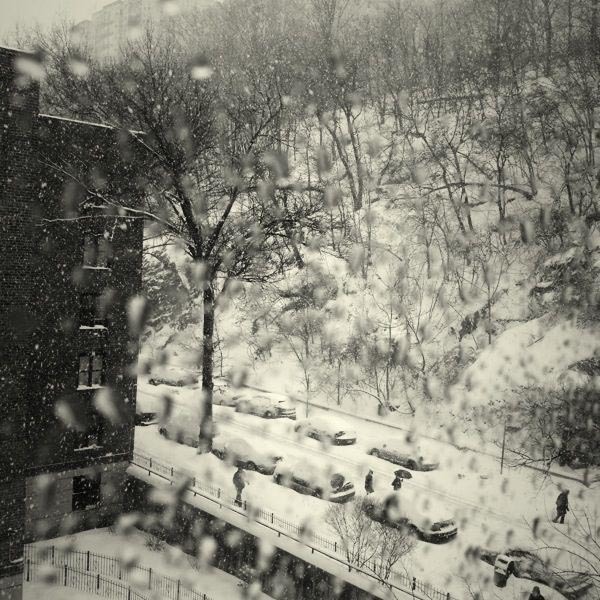 Blizzards started rolling through NYC. This is the view from my new office/studio/guestroom. 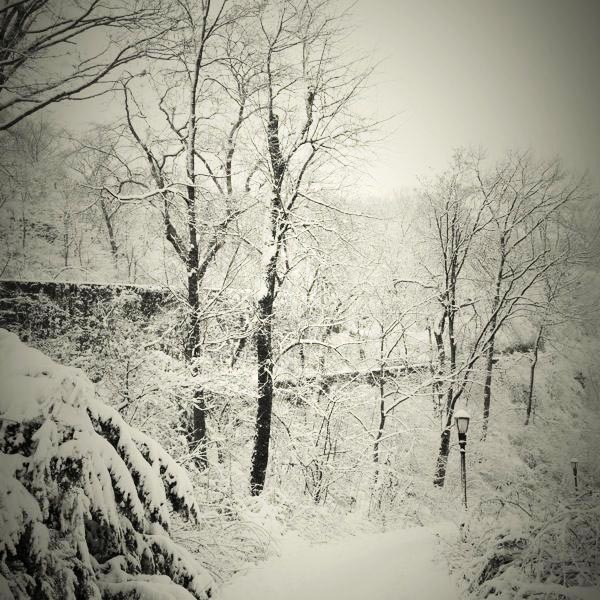 Hello Fort Tryon Park! 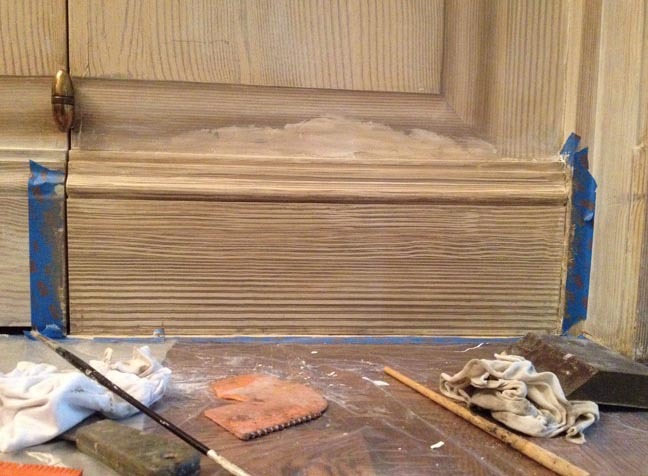 With an assistant, I glazed this Park Avenue lobby in various shades of cream. 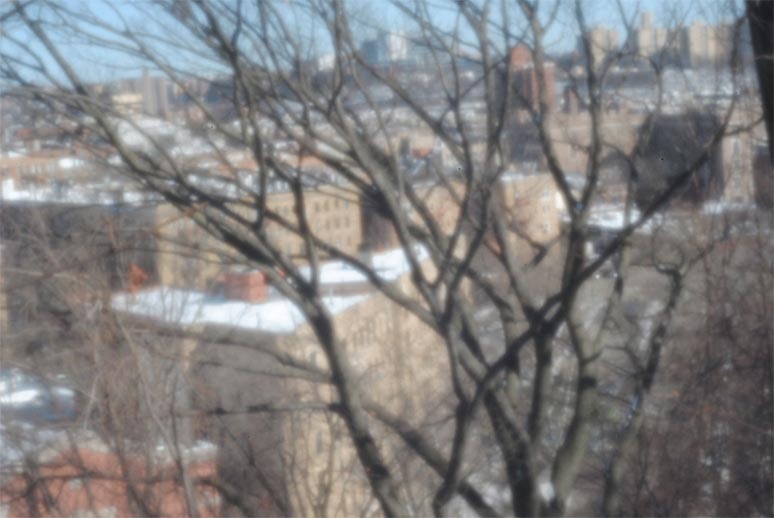 It was time to experiment with a new pinhole lens for my Nikon D3000. I tried it for a couple of weeks and I really wanted to like it, but it left me cold. My photos bored me to tears. So much for that. Next up, tackling the dining area in my new place. 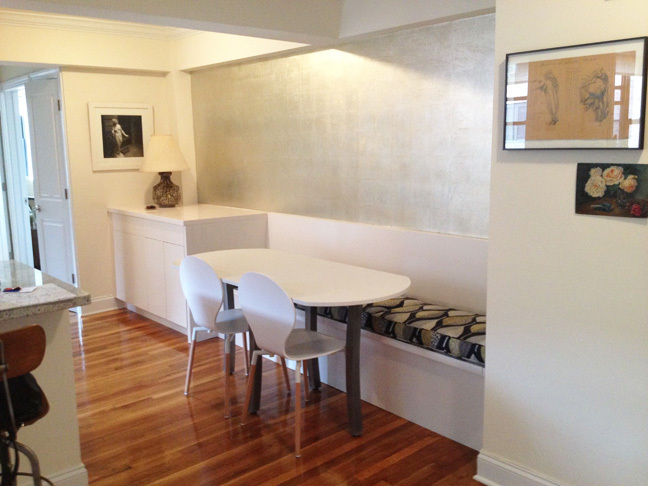 In NYC, some apartments have a dining nook, which is basically a glorified hallway leading from here to there, but widened out by a couple of feet to give the illusion that a table, chairs and family of four could somehow wedge themselves into this sorry excuse for a room. 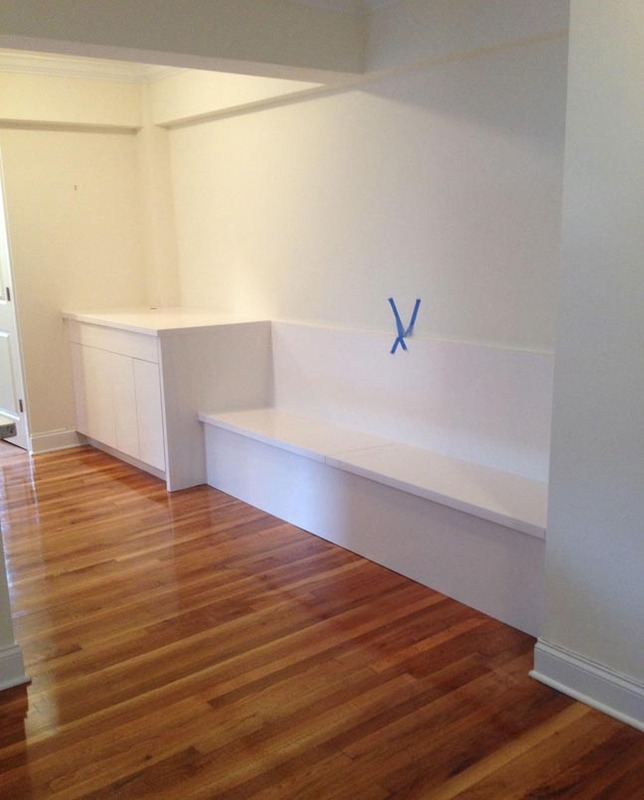 I decided to have a cabinet maker build a long banquette bench with storage inside and extra cabinets for even more storage at one end because in a New York apartment, storage is king. 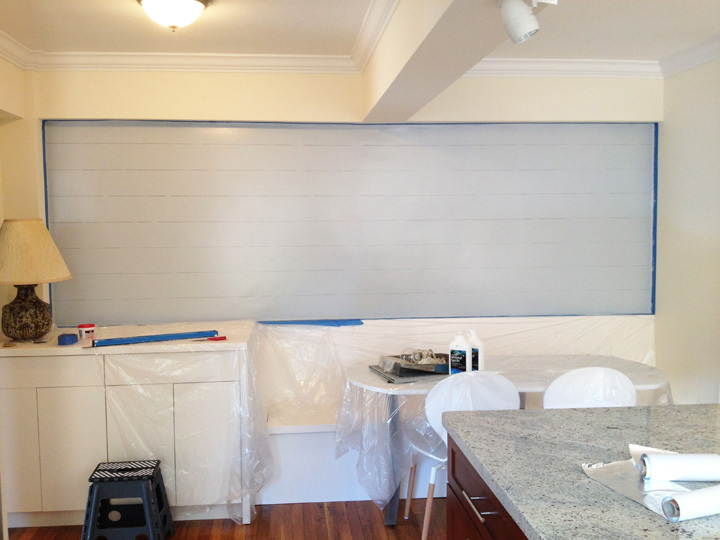 The distance from the wall on the right to the countertop on the left is just under seven feet. Here’s the before shot. Here’s the after shot. Missing: bench cushions, table, chairs, and wall treatment. I’ll write a separate post about the process with more details once I’ve finished everything up; it will include the most fantastic table ever. 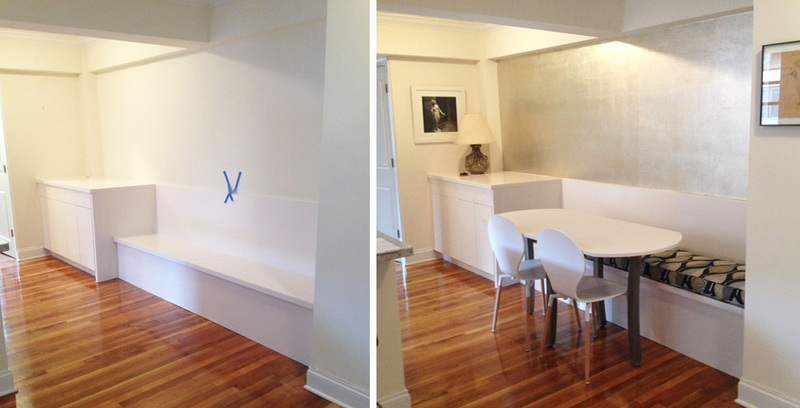 It was such fun to design and pull this space together. More blizzards. 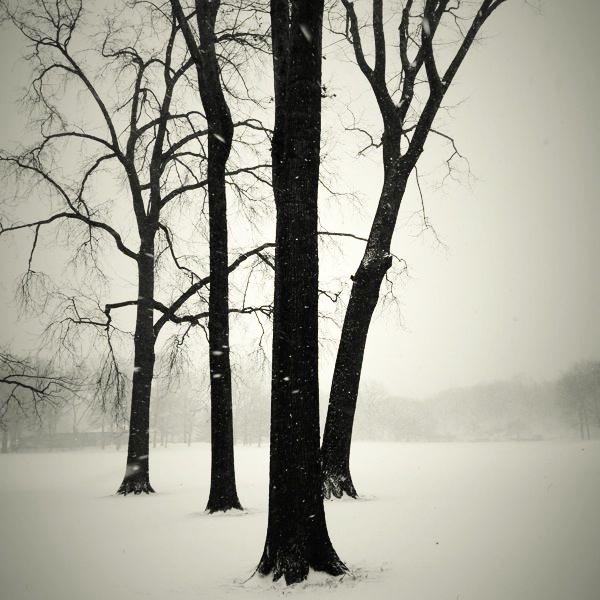 Central Park, lovely in the snow. 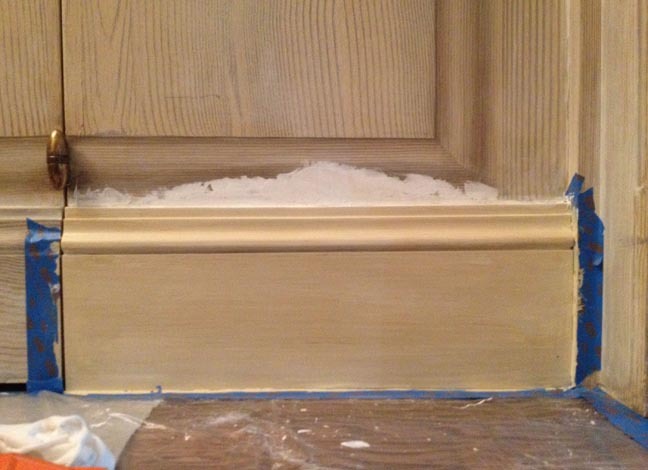 I glazed and gilded this little cabinet in a client’s entryway. 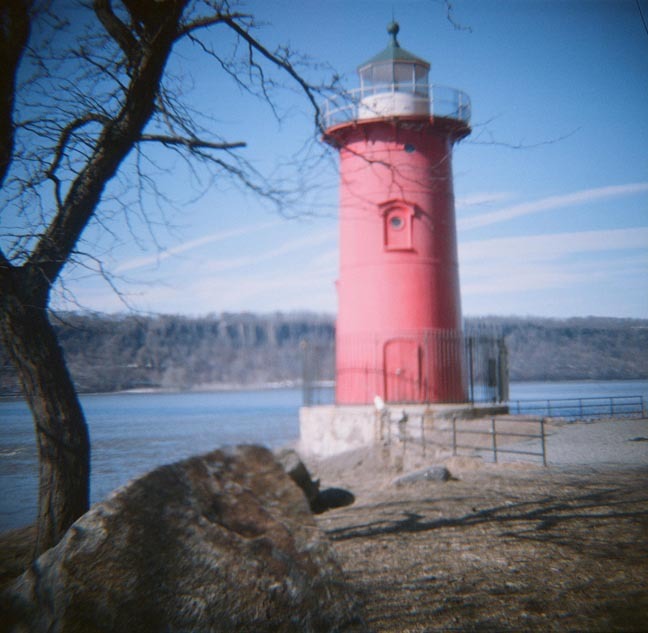 Thought I’d try shooting in color for a change, so I stuck a roll in a Diana camera and went out for a spin. 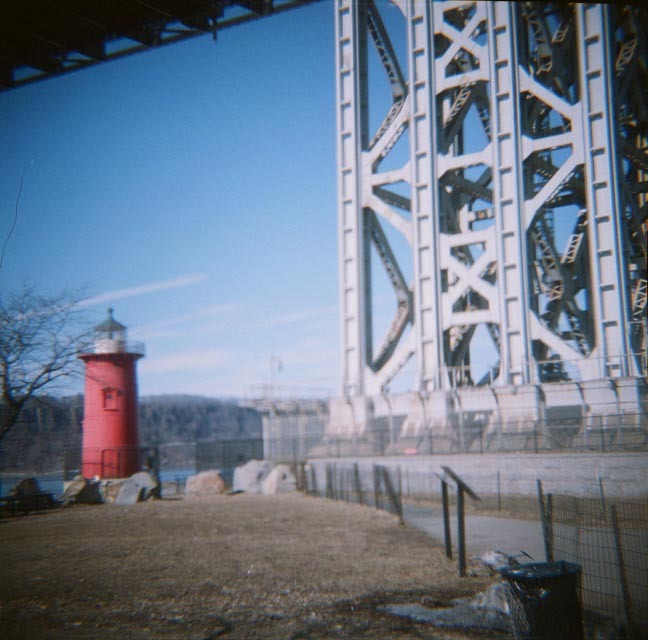 This is the Little Red Lighthouse at the base of the George Washington Bridge, a few blocks south of my apartment. I love film! Still shooting with my phone while exploring my new neighborhood. 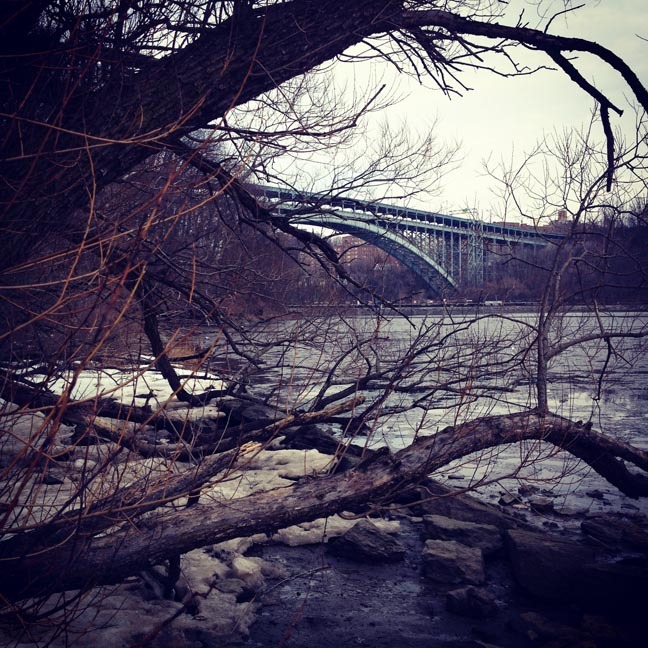 This is the Henry Hudson Bridge, which spans the Harlem River where it meets the Hudson River, connecting Manhattan to the Bronx. 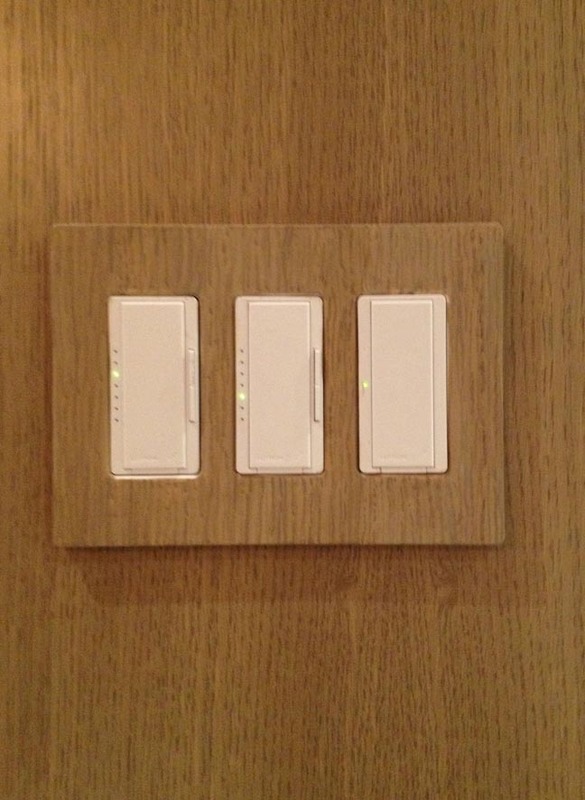 Spent a couple of days matching switch plates to oak and marble. Bought a film scanner, so I can finally scan my neglected negatives. 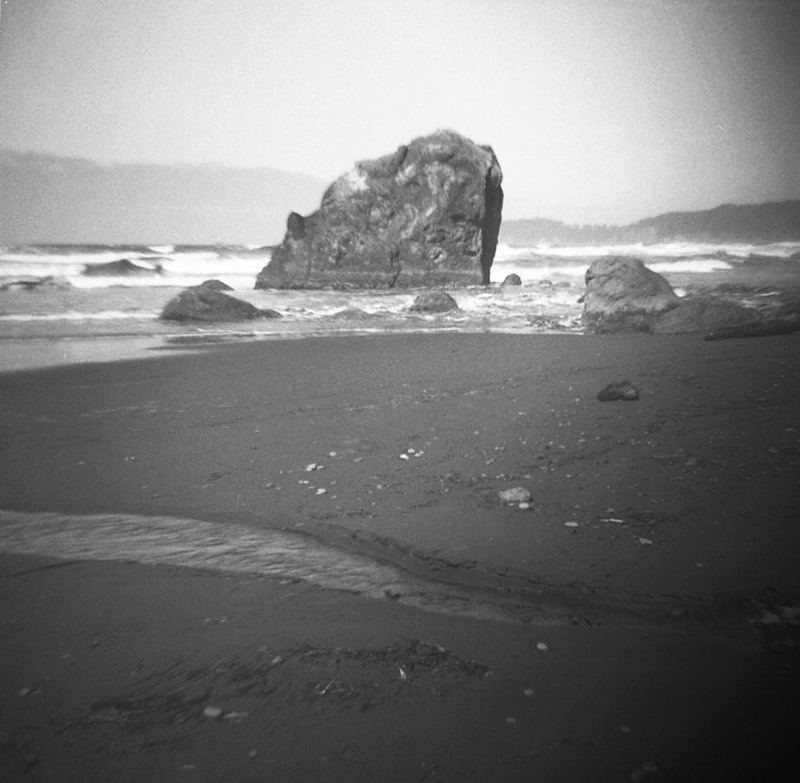 These photos are from a September 2012 trip to the west coast, the Olympic Peninsula in Washington state, that I’d never printed. When I left my last apartment, I left behind my darkroom, aka the windowless kitchen. I was so tired of setting up and tearing down my darkroom whenever I wanted to print that I hadn’t printed in over a year. Of course, now I miss it and want a darkroom again. I hauled all of the darkroom stuff here, but haven’t quite figured out how to create a darkroom in a place that’s full of windows. Stay tuned on that. More color matching, this time light caps in a mahogany-paneled ceiling. Did I mention how much it snowed? 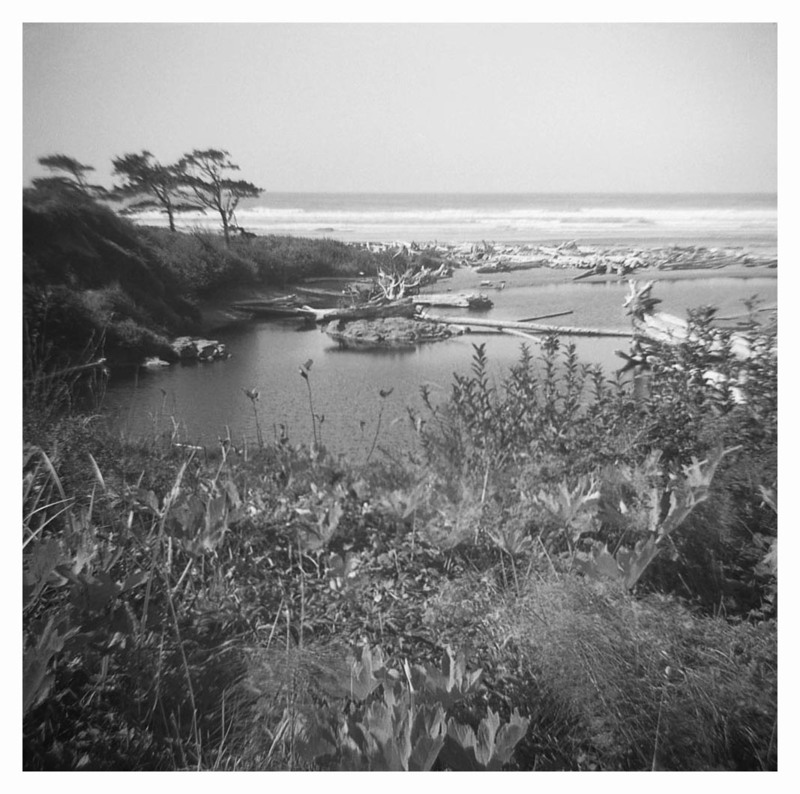 And last but not least, I started a photo project on my iPhone using the Retro Camera app. Usually when I work in someone’s apartment, there isn’t much to photograph when I’m done, since the rooms are emptied out before I begin and my painted finishes are often subtle. 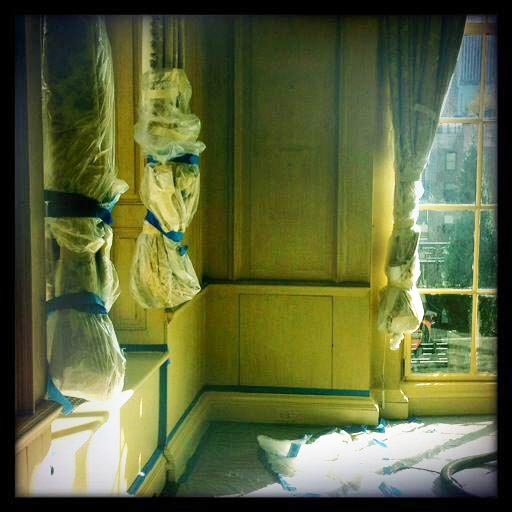 So I thought it would be fun to photograph details of the rooms in progress. 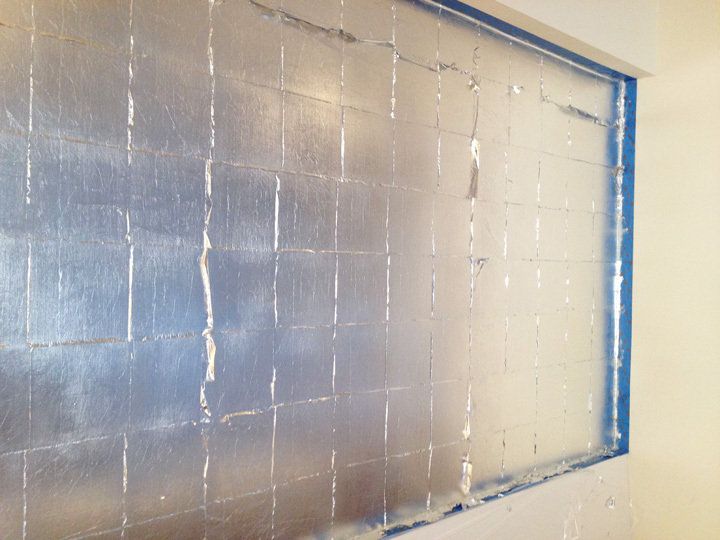 Here, all of the drapes are wrapped in plastic for protection, portions of the walls are taped for glazing and the floor protection has been pulled away to tape off the base boards. That sums it up for now. I’ll be back to posting regularly. Thank you for reading and following me! Last week, I drew the parameters of a project I was working on in my sketchbook journal. This week, I’ll follow up with the details. 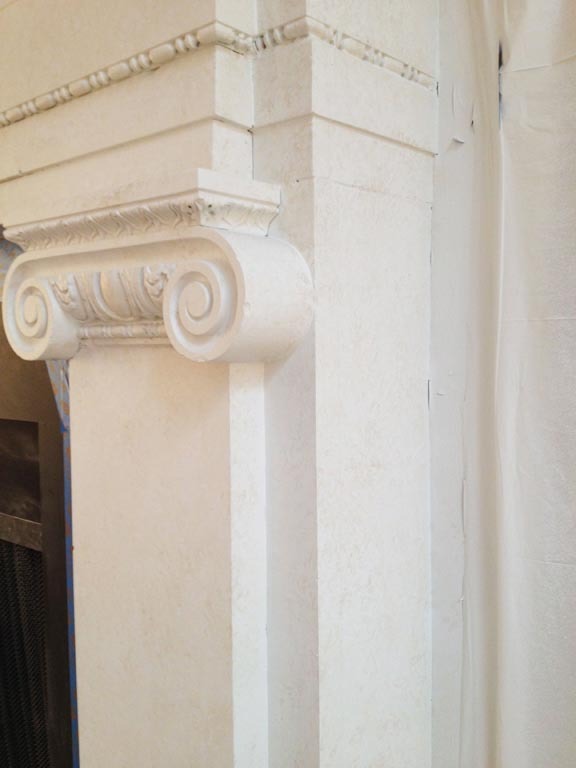 The task: to paint an old marble fireplace to look like limestone, matching stone that was recently installed in the room. This is the former fireplace. 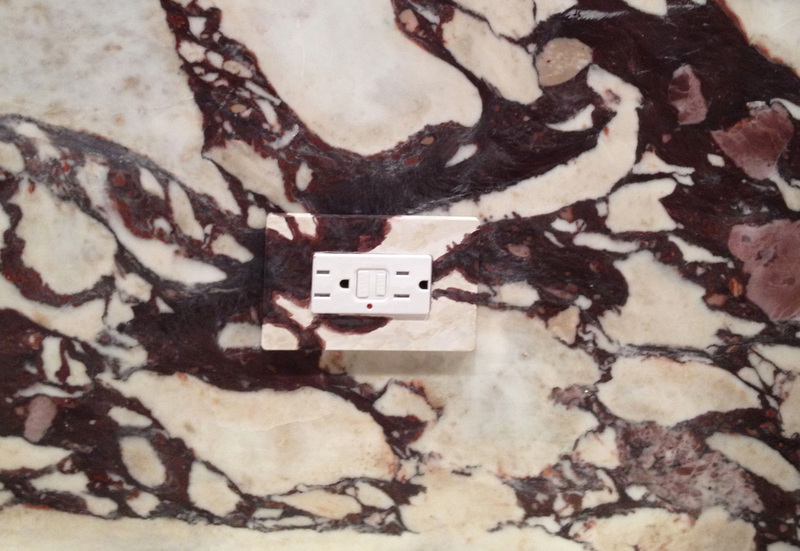 It’s probably a variation of Yellow Sienna marble. Sorry about the plastic wrap, these are the only photos I have. Here’s a detail. 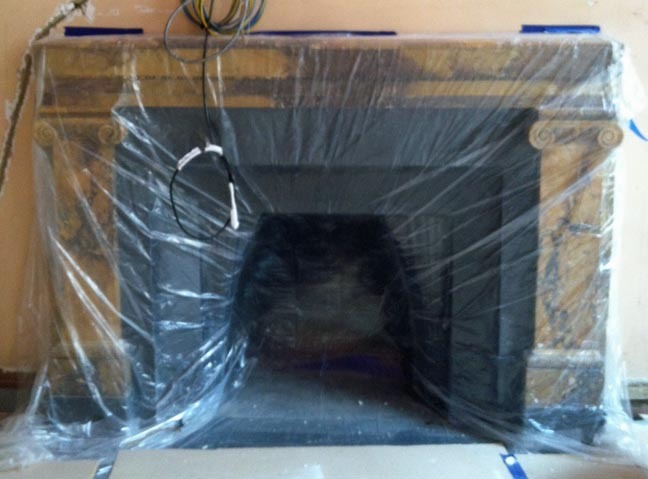 Still, you can see how strong the yellow and brown marble is, and can probably imagine how this sort of fireplace will insistently draw the eye. 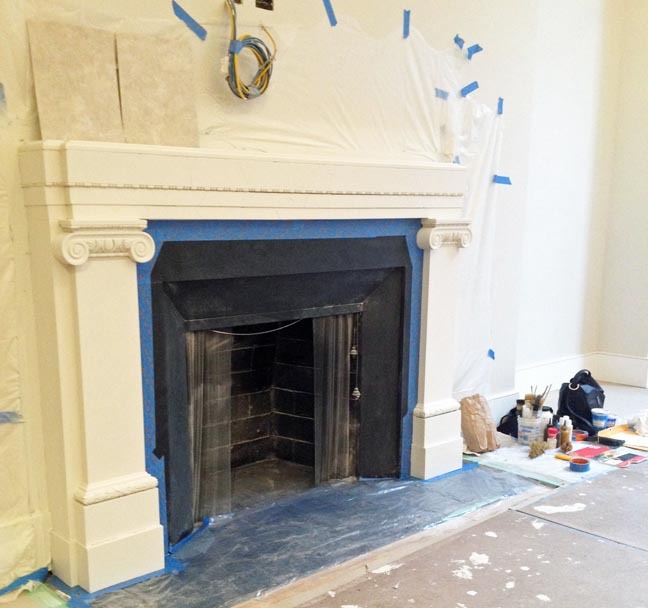 If the designer decided to keep this fireplace, he’d have to balance its heavy visual weight with the other elements and furniture in the room, and integrate or balance its color palette. 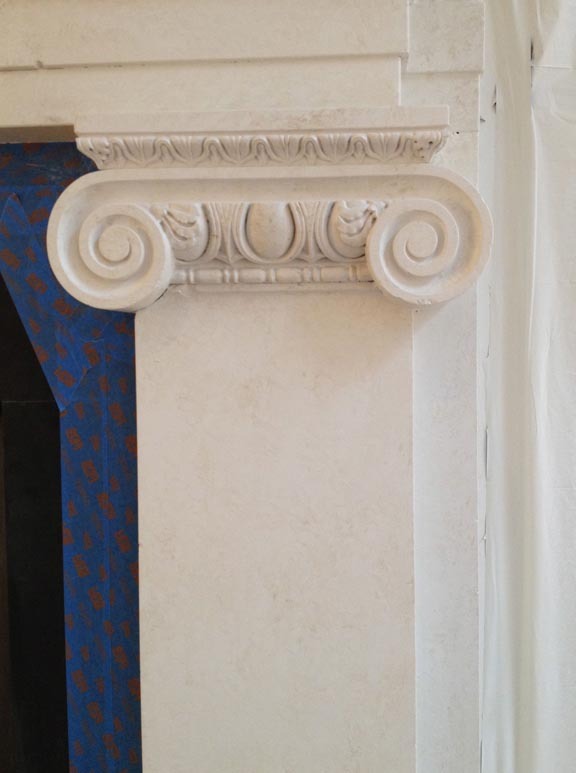 One way to trick the brain into believing that the soon-to-be painted finish is real is to match a stone that’s in the room. 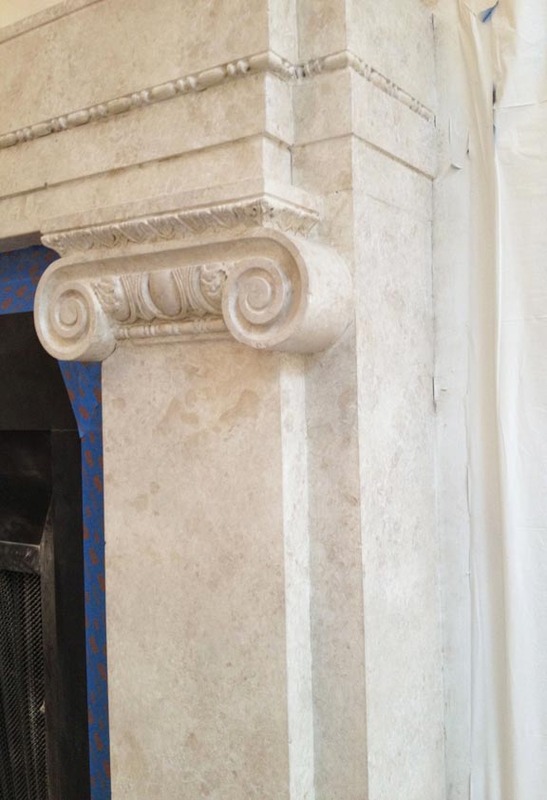 In this case, slabs of limestone were installed in the doorways. This is a shot of the stone. 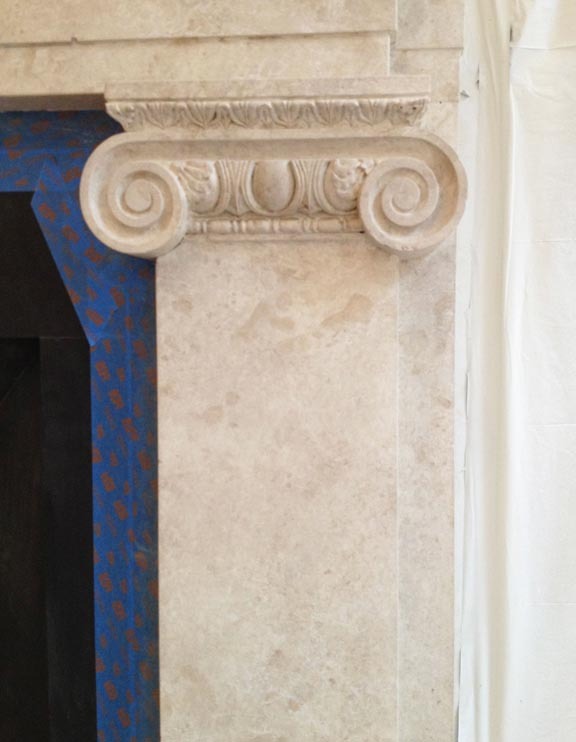 Since the limestone doorways must be passed through to enter the room, our brains will register their stone, then look at the fireplace and assume it’s real, partly because we’ve just seen the real stone, and partly because we expect a fireplace to be made of stone. Our conscious minds won’t be aware of this process. 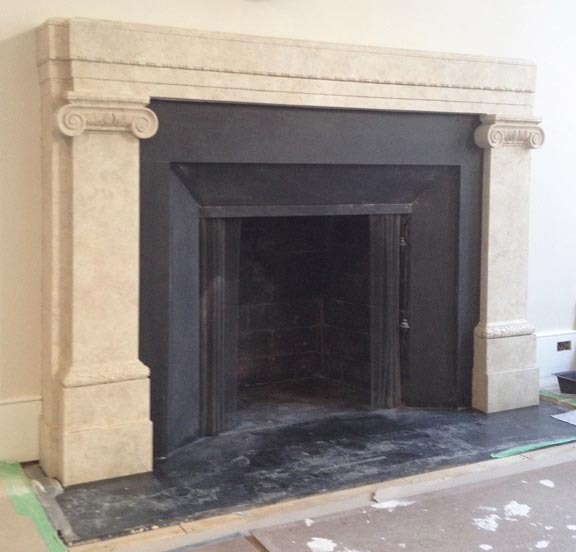 Here’s the fireplace, now painted bone white, a blank slate. My two samples are sitting on top, but I’ll work off of the real limestone. My work station is set up off to the right. The first step, as usual, is to tape off and protect the adjacent surfaces. 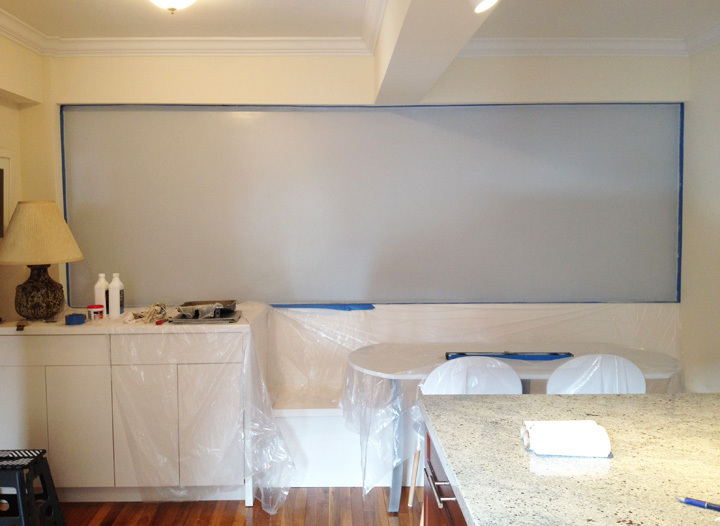 The base painters, who sprayed on the base coat, had already protected the walls. 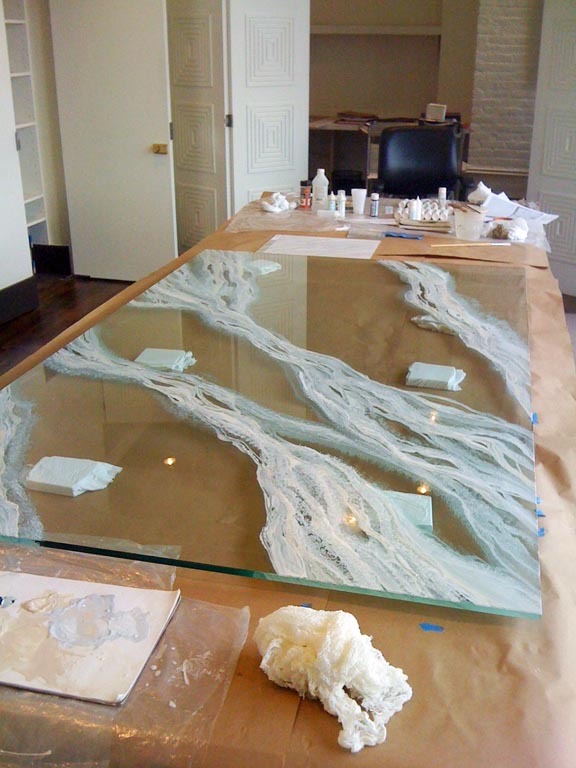 Painting most marbles is a process of building up layers of color, which creates visual depth. 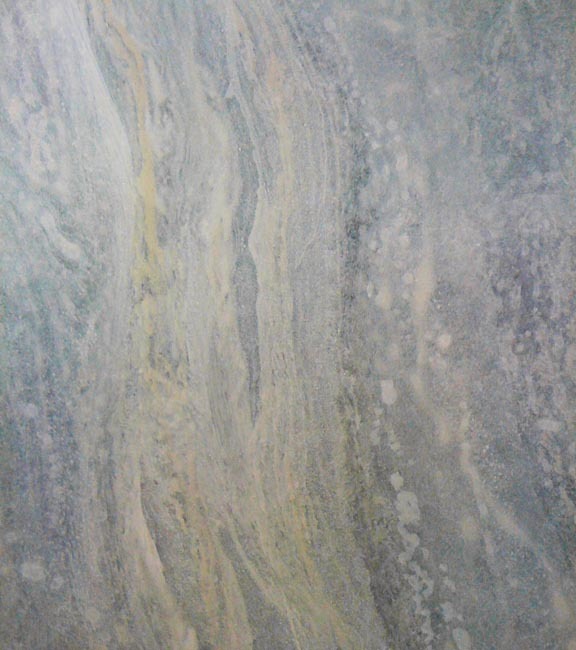 Marbles can have enormous depth, so generally, the flatter a painted stone looks, the less convincing it will be. That’s why we start with such a light base color, so it can shine up through the translucent layers of darker glaze, creating depth. Off we go. You’ll see this process from two angles. 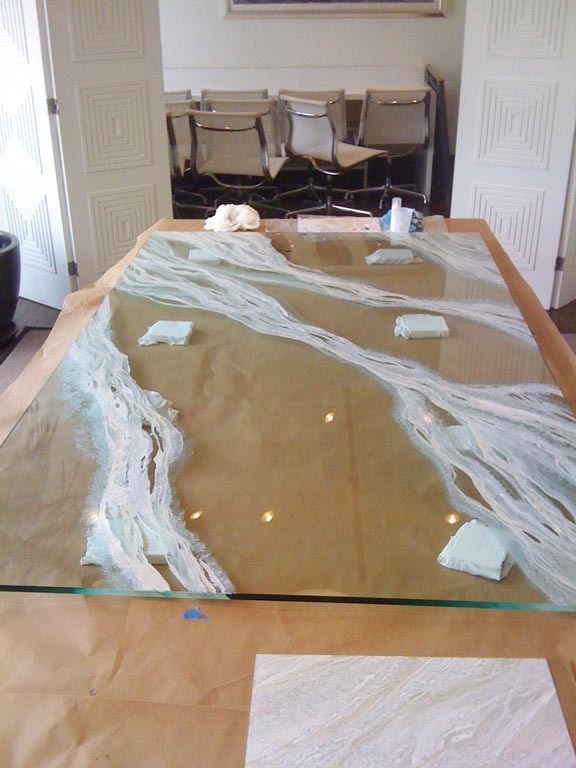 First, about six or seven layers of acrylic glaze are applied with a damp sponge. The colors are a mix of white, raw umber and raw sienna, with a little black. Here’s the progress of the right-hand column. 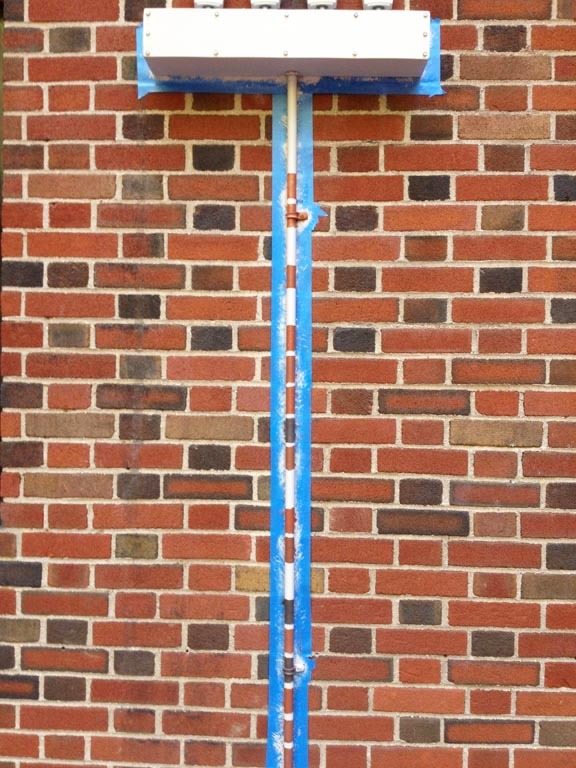 Now, the side of the right-hand column. The colors gradually build up, but the base coat needs to show through as well. Next up, the detail work that will pull the patterns together and punch up the depth. Out goes the sponge and in comes a little brush. It’s time to link up the patterns of the sponge to create direction and flow. We’re going from general to specific. This will make the stone come to life and will take the better part of a second day. The blobs are painted with the darkest color that will be used and softened with a badger brush. Then, using a toothbrush, I spatter on the same dark color and a light cream. 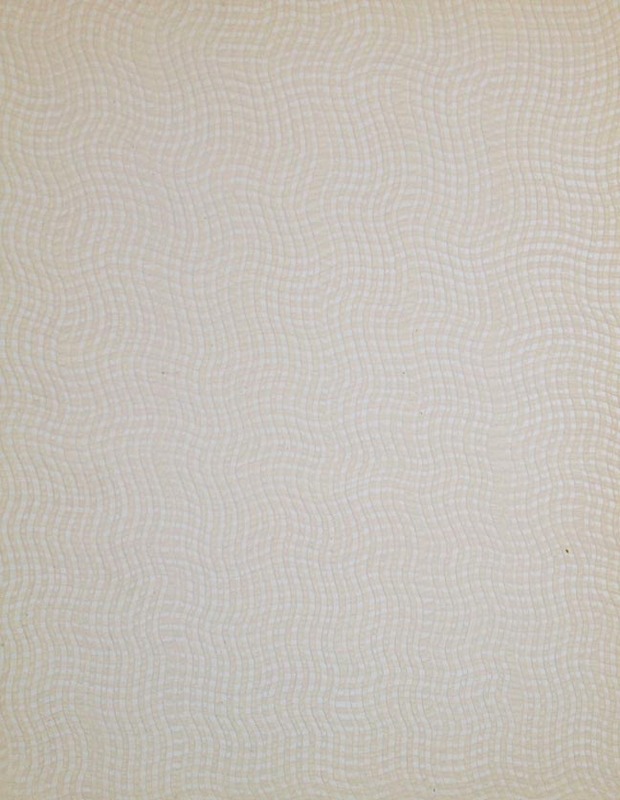 Then on top of the dark blobs and the spatter comes the lightest color, a fine web of creamy lines gently pounced on with a barely damp sponge, its patterns joined together with a fine brush. With the darkest and lightest colors right on top of one another, here comes the depth I’ve been working toward. A coat of matte varnish, and the final result. 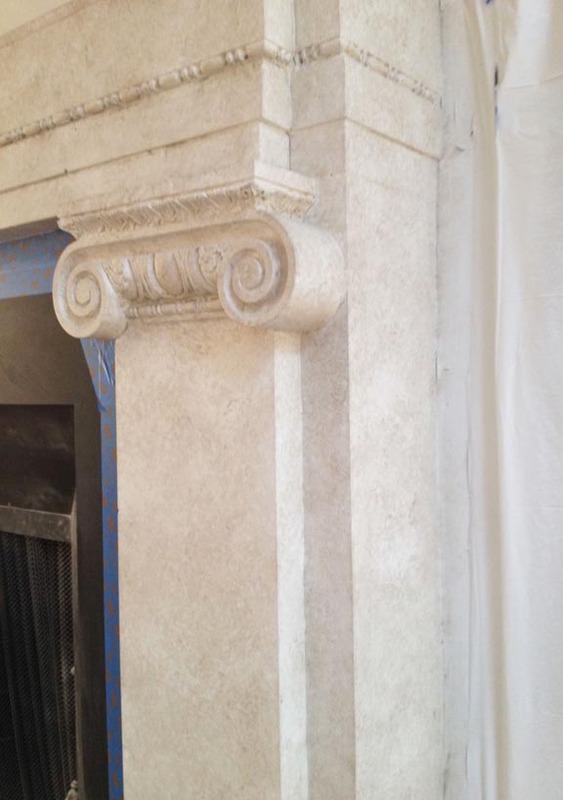 It’s hard to see the details of the painted surface in a photo, but it’s easy to see how the mood of the room has completely changed because the stone has changed. 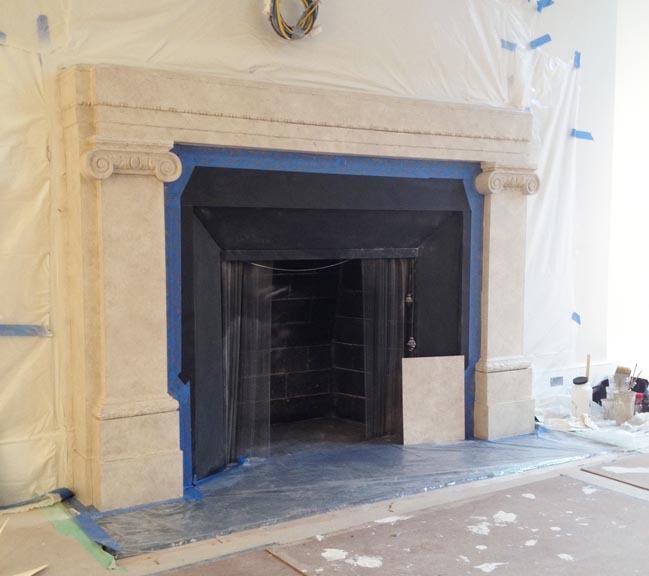 We’ve gone from loud to subtle, from old-fashioned to contemporary (well, as contemporary as you can get with columns), and most importantly, we’ve changed the color palette, integrating the fireplace into the room’s new design. 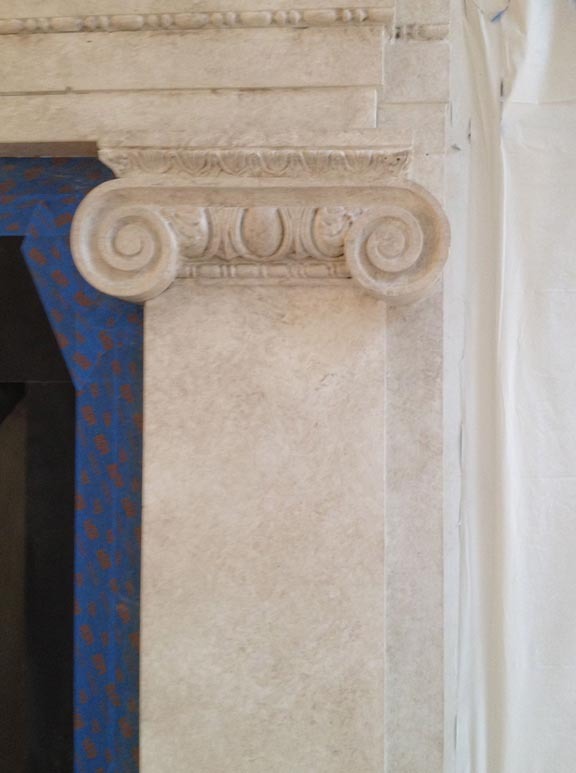 Also, we can see the details of the columns caps more clearly, now that they aren’t dominated by the marble’s pattern. Magic? Not quite. But almost as much fun! Here’s a little job I took care of last week: playing magician again, making things disappear. It’s funny how, once a client finds out something is possible, they’d like it done everywhere. In this case, it was my ability to paint light caps to blend into the background that landed me in the bathroom. 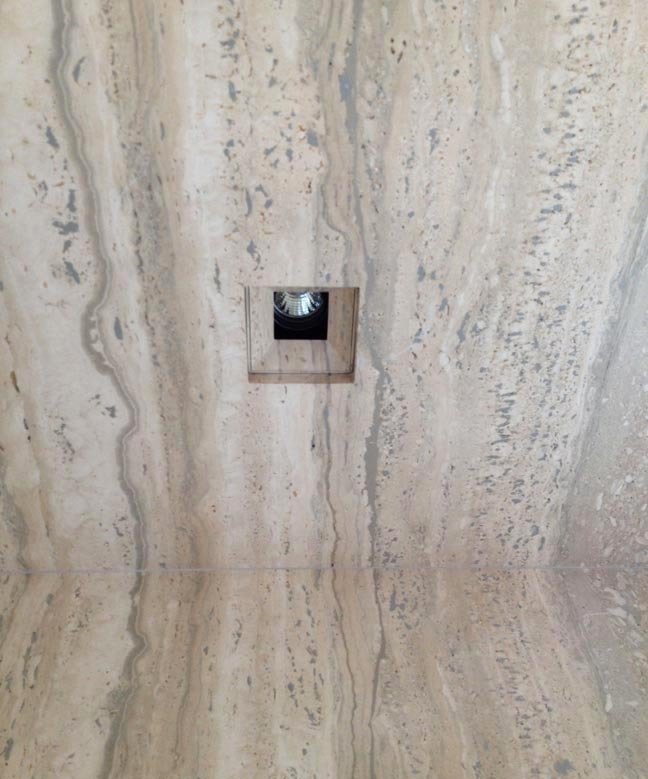 This is a beautiful bathroom almost entirely clad in a gorgeous travertine, a form of limestone. 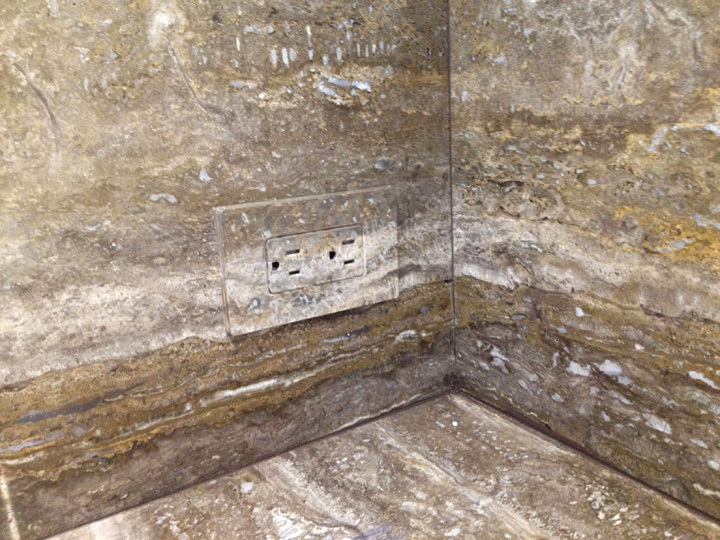 Here’s a corner of the room, to show how the stone flows together. 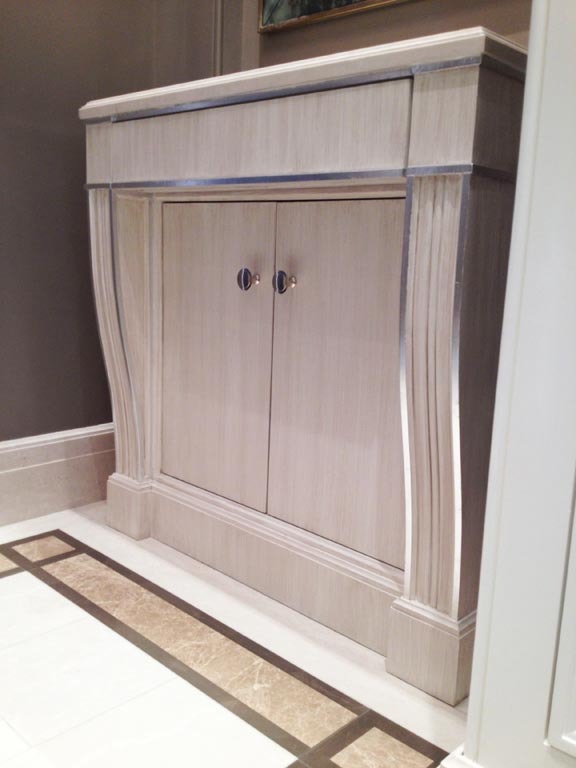 I love rooms like this: so well thought out, the stone perfectly cut, such precision, no room for error. 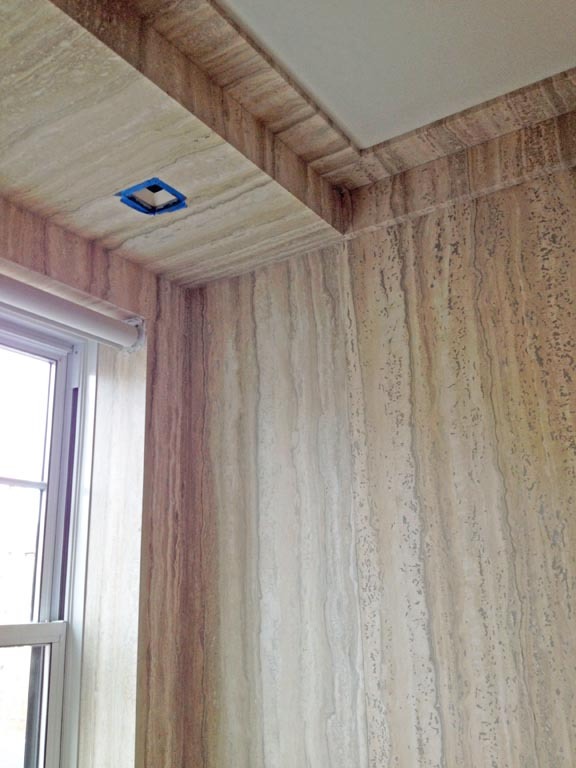 You can see how the uninterrupted pattern moves up the walls to the crown molding, over soffits and around corners, revealing that the pieces are cut from a single slab before assembly. 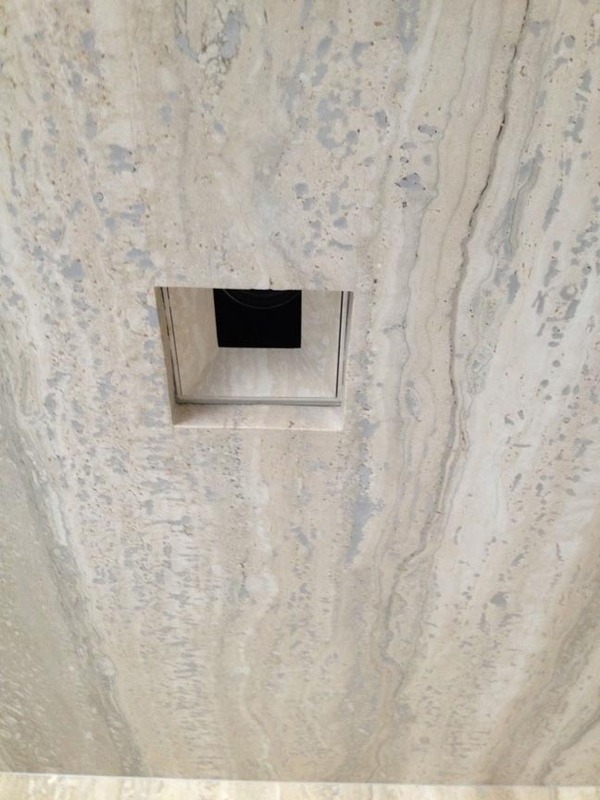 Stone covers the floor as well, including the interior of the shower stall, and juts out to create a countertop around the sink below the window. 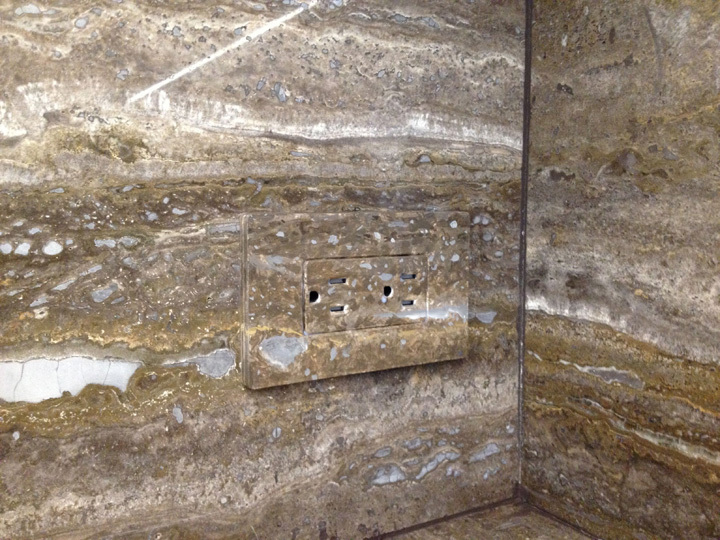 Stone installed in this way is usually about 3/4″ thick. 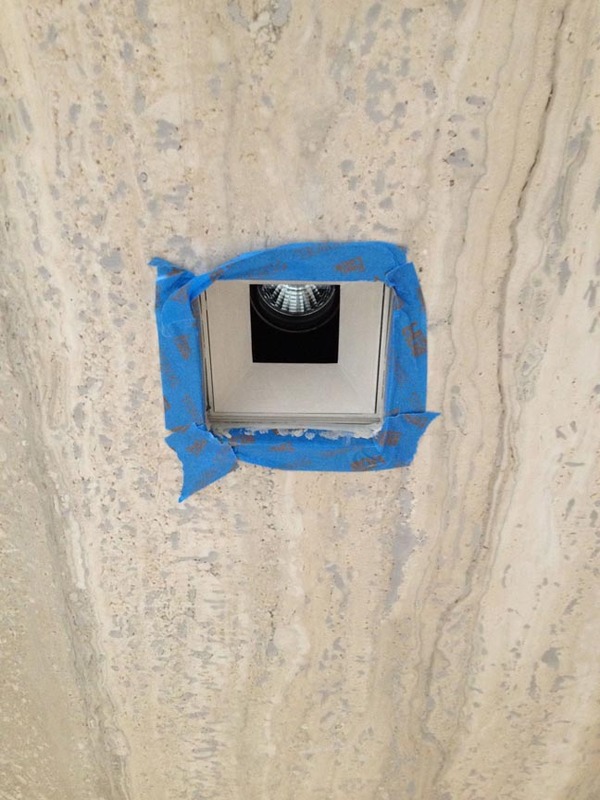 There’s one of my little light caps taped off above, inset into the stone-clad soffit. There were four lights in all, three set into the ceiling soffits and the fourth in the shower. 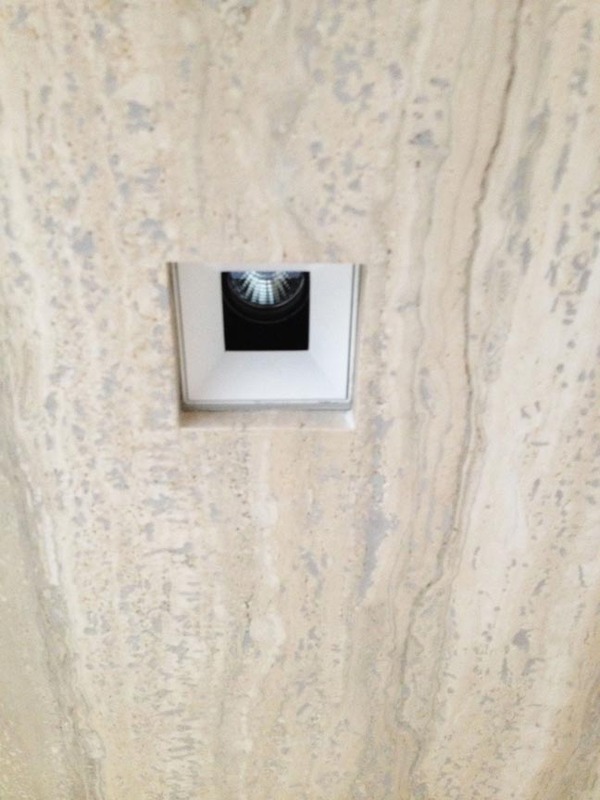 I’m painting the fixture itself, so that it will appear that the light is shining from a hole in the stone. 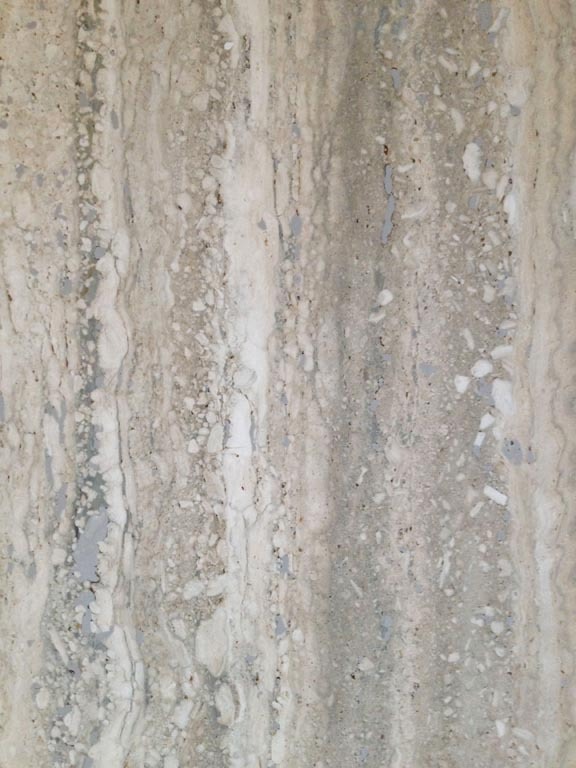 This is a close-up of two sections of the travertine. It has a random design that’s almost blurry, all sorts of organic patterns blending together in shades of white, cream, brown and grey. So pretty. 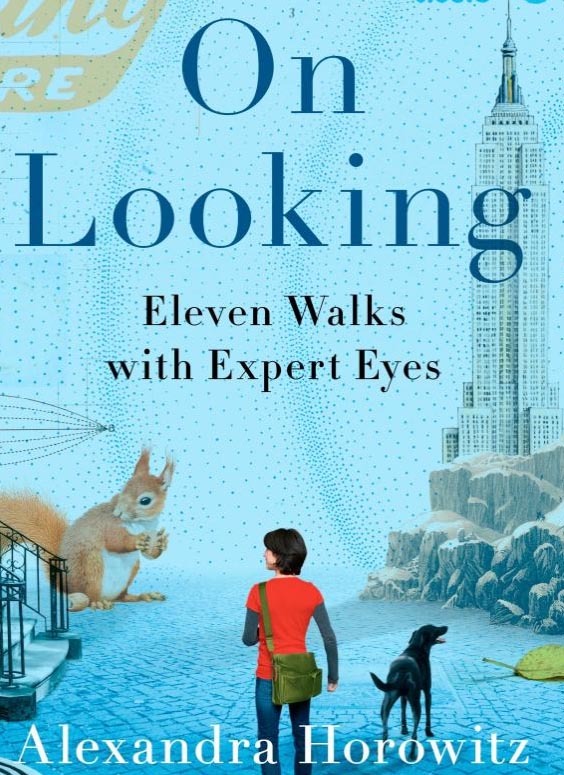 I’m in the middle of reading a book called “On Looking: 11 Walks with Expert Eyes,” and in one chapter, the author circles a New York City block with Sidney Horenstein, a geologist from the Museum of Natural History. He points out that when we think about geology, we think about what’s underfoot. But in a city, geology surrounds us. Starting on a large scale, with the stone used to construct the streets and buildings, then moving to the smaller scale of the stone and natural materials we use in the interiors of our homes. 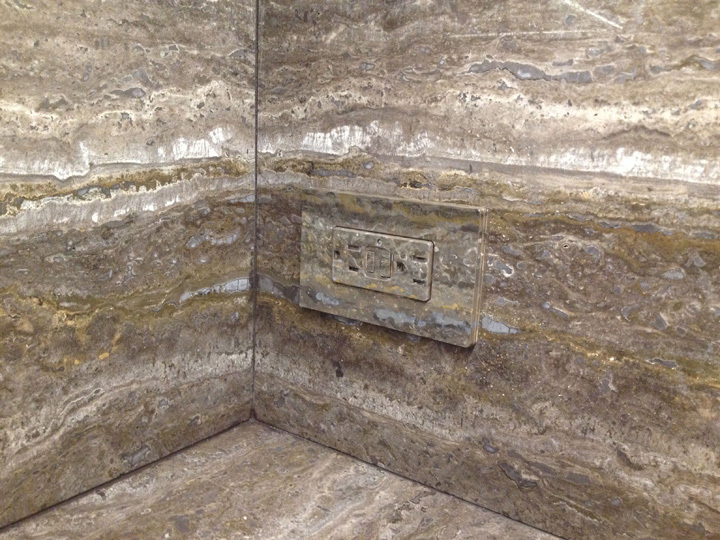 We are surrounded by stone that was millions of years in the making, each from a specific geographic area. 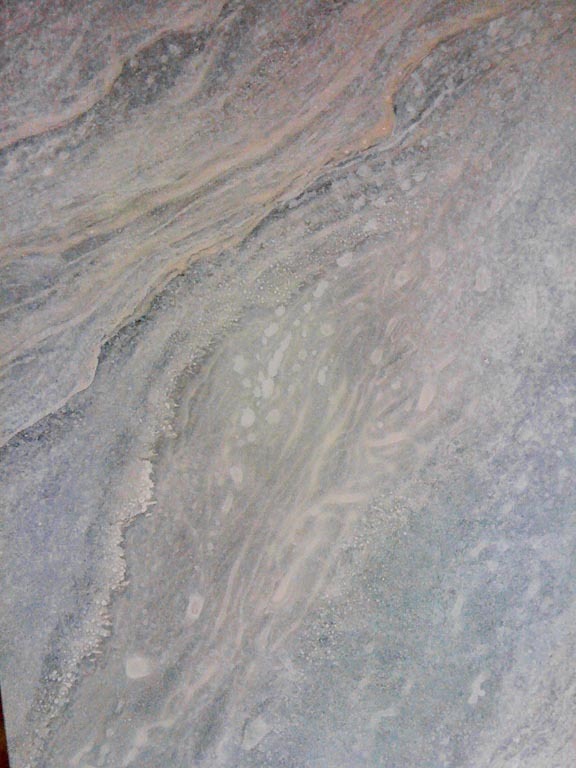 Have you noticed that some stones have patterns that resemble liquid? It’s because its particles were once suspended in liquid. 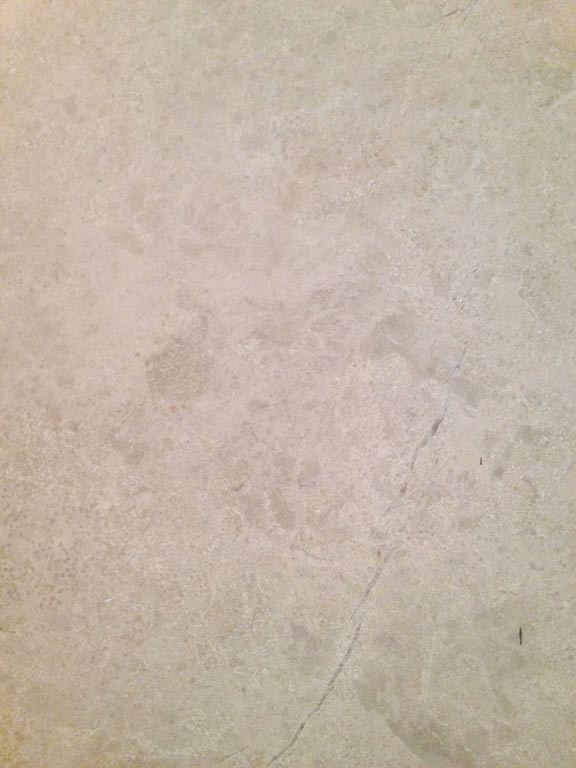 Travertine is a sedimentary rock composed of calcium carbonate, formed when river and spring waters evaporated, usually near hot springs or in underwater caves or water tables. 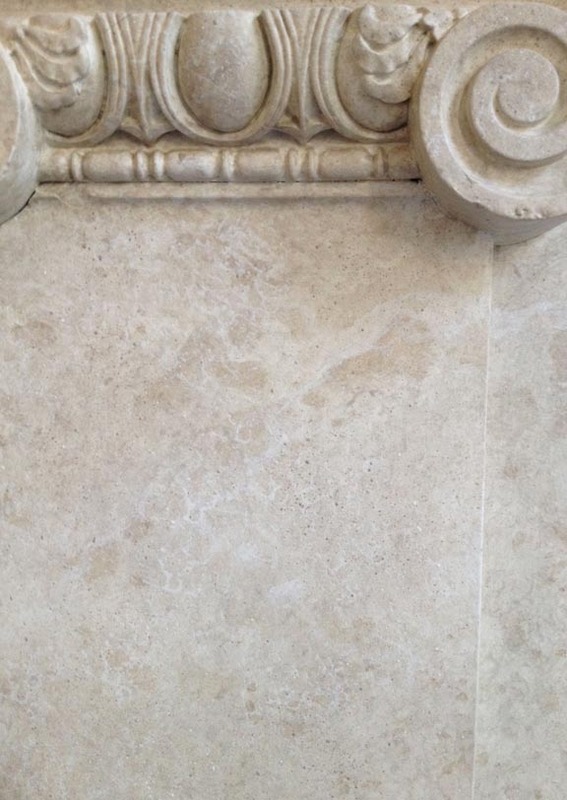 Limestone often contains seashells and remnants of ancient sea life. 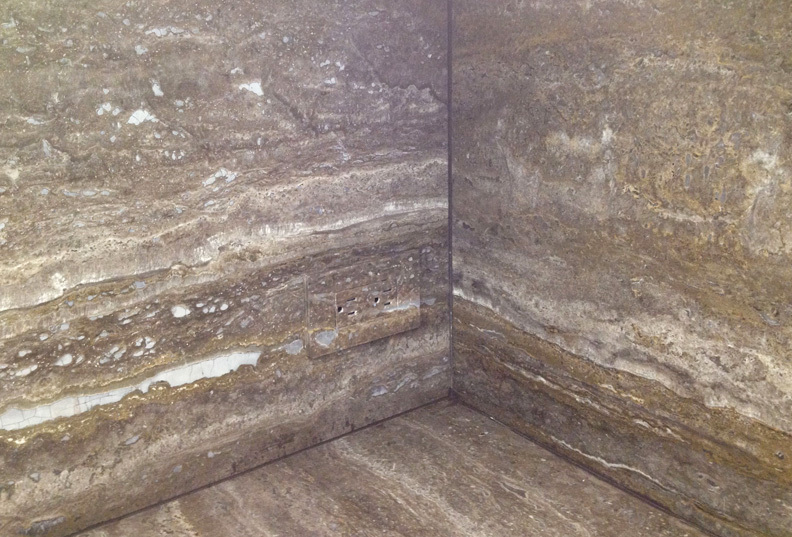 Depending on where the stone was quarried, it could be millions upon millions of years old. Back to those light fixtures. Below is the first light, naked and way too noticeable. 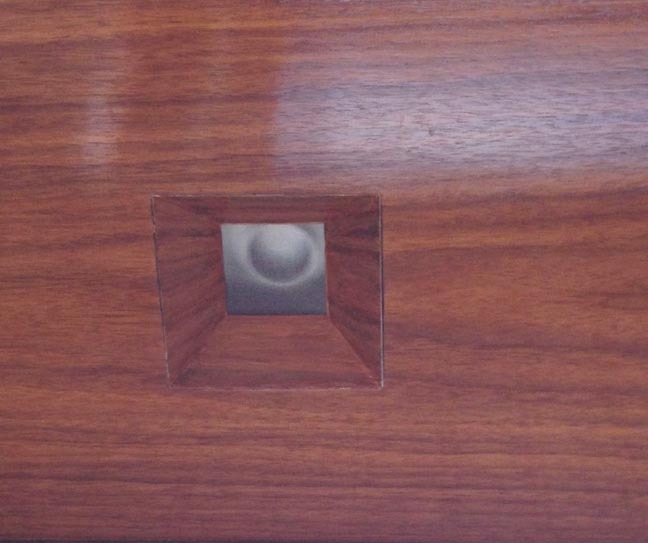 The fixture is about three inches square. First thing to do, sand it a bit to get a little tooth on the surface, then tape it off and prime it. I added a bit of raw umber and raw sienna to my white primer to head the color in the right direction. With stone like this, I’m working from general to specific, so we go for the big patterns and directions first. The palette is easy because the colors are so limited. I’m using Golden Liquid Acrylics in white, titan buff (a cream), raw sienna, raw umber and lamp black. Here’s the first pass. The key to tricking the eye, besides getting the color right, is to continue the pattern onto the new surface, as if I’m simply filling in the blank that was lost when the opening for the light was cut into the stone. Then the fun starts, bouncing my brush around to create all kinds of squiggles and dots. After two more passes, I’m done. 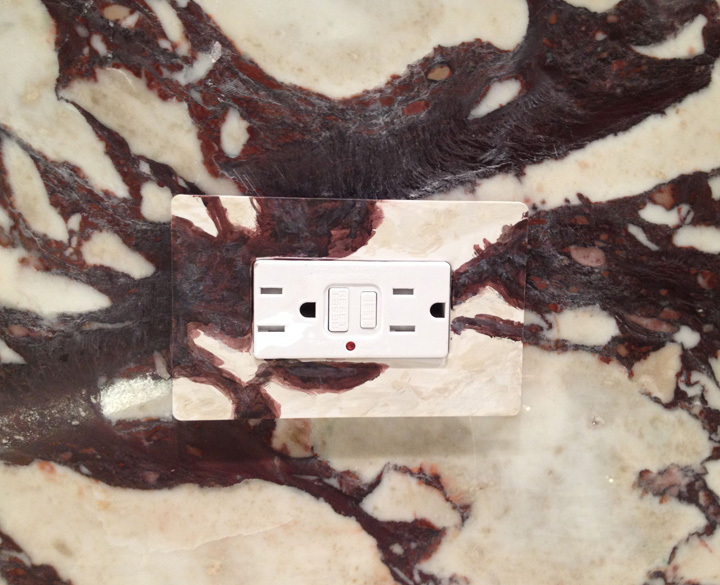 To finish, I clean up the messy line between the stone and the fixture. 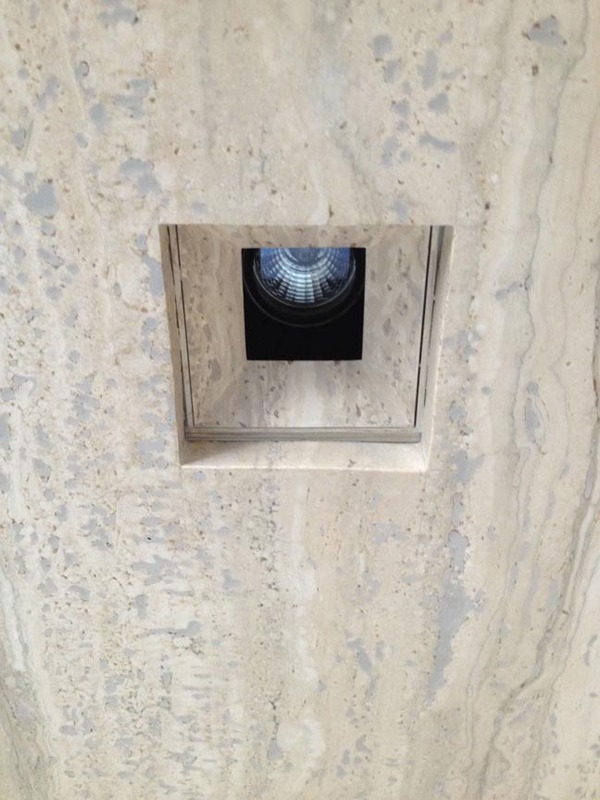 Here’s another, with a close up of the stone turning the corner of the soffit to go down the wall. Look at that perfect match-up in pattern. When I first became a decorative painter, I was only vaguely aware of my family history. I knew there were many decorative artists on my father’s side of the family, but I didn’t know that I was a fifth-generation painter until after I had started my company. The day I finally got a clue, I’d been in business for less than a year and was rummaging through my grandfather’s garage in Hof, Germany. My father’s cousin, Karl Heinz, had given me a big bag of paint brushes, since I was the only artist working in the family, and it had piqued my curiosity. In my Opa’s garage, I found a few treasures tucked away that told a story. I found a sign for his business, hand painted on glass. 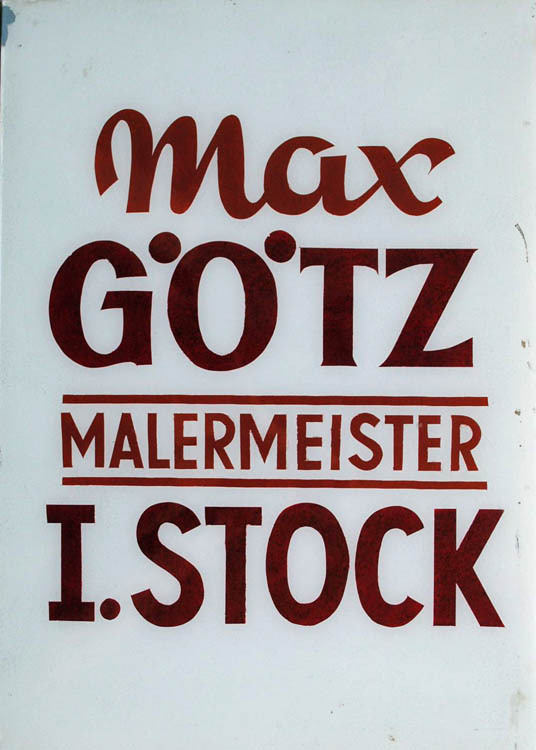 The translation is Max Gotz, Master Painter, First Floor. 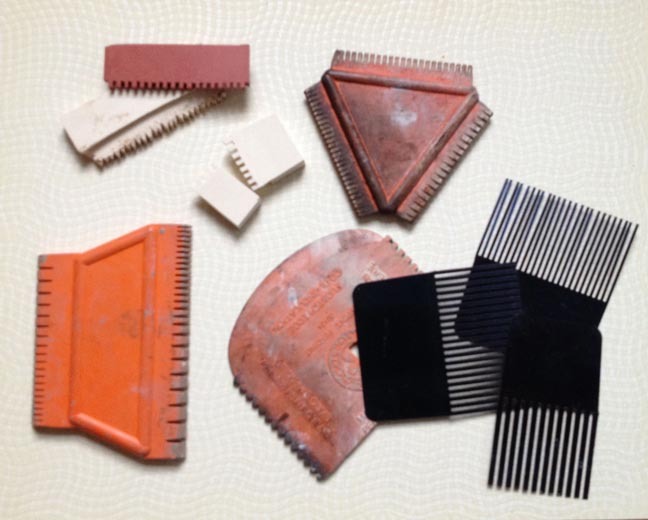 I found envelopes of colored metallic powders, cigarette tins full of brush tips and invoices from two generations. First, my grandfather’s. Hello Bauhaus! Love that design. So German! 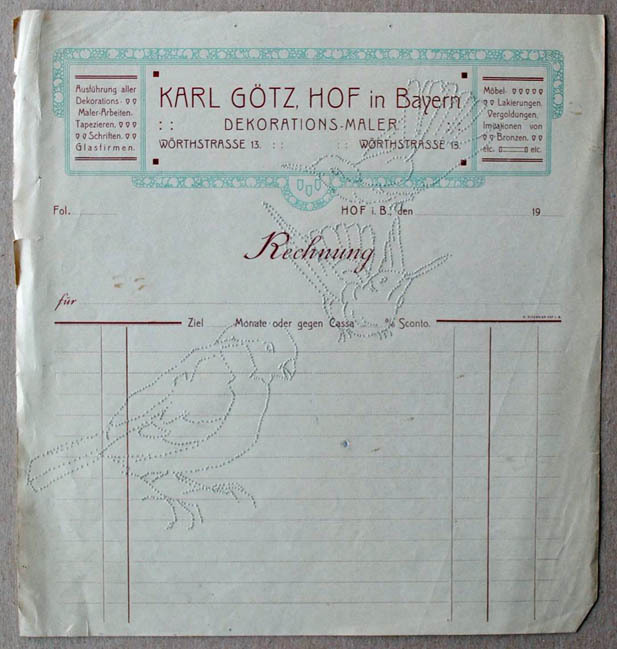 I found my great-grandfather’s invoices, too. Look at this beautiful design! Think William Morris might have been an influence? Arts and Crafts for sure. 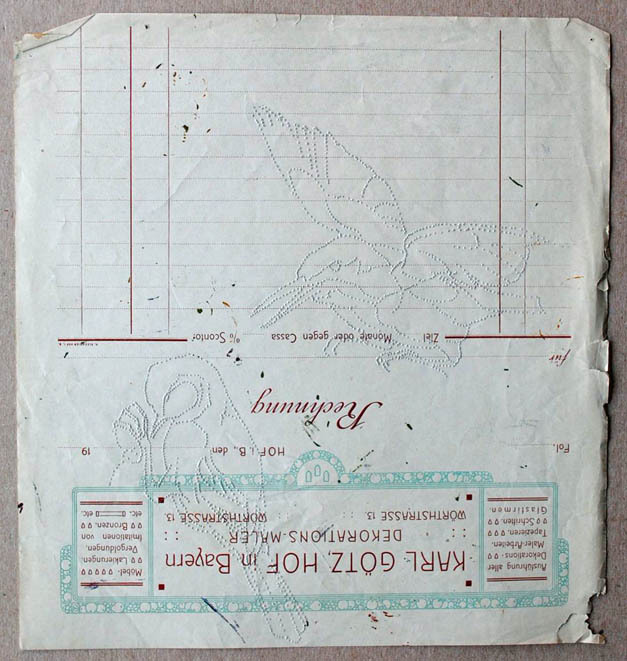 Even better, the invoices have been used as scrap paper to transfer drawings to another surface. How do I know this? Do you see those two faint birds on the sheet? Their outlines are created by tiny holes that were made with a pin or an awl. 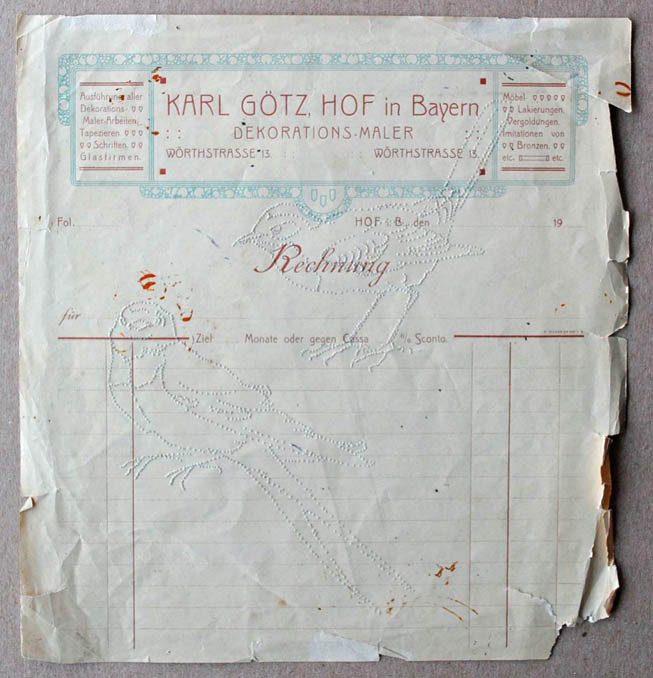 This is the back of the paper, showing the actual drawing. This is a technique called pouncing, where a drawing is transferred to another surface by creating those tiny holes, then pressing graphite through the holes to reproduce the image. But whose drawings are they? My grandfather’s, my great-grandfather’s, or someone else’s? I love the idea that we’re all linked together, that all of us are connected by an invisible web. 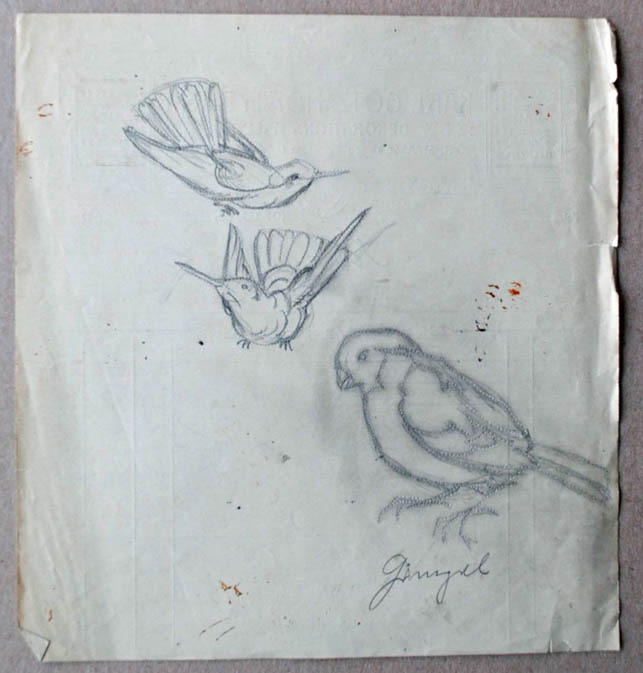 These bird drawings remind me of that because now they’ve pulled in more members of my family, not just the artists. My brother is an avid birder, as are both of my parents. Were other members of the family interested in birds as well? The above invoice seems to name the birds. Look how carefully they’re drawn, especially the detail in the top bird’s wings and legs. Here’s another set of drawings. 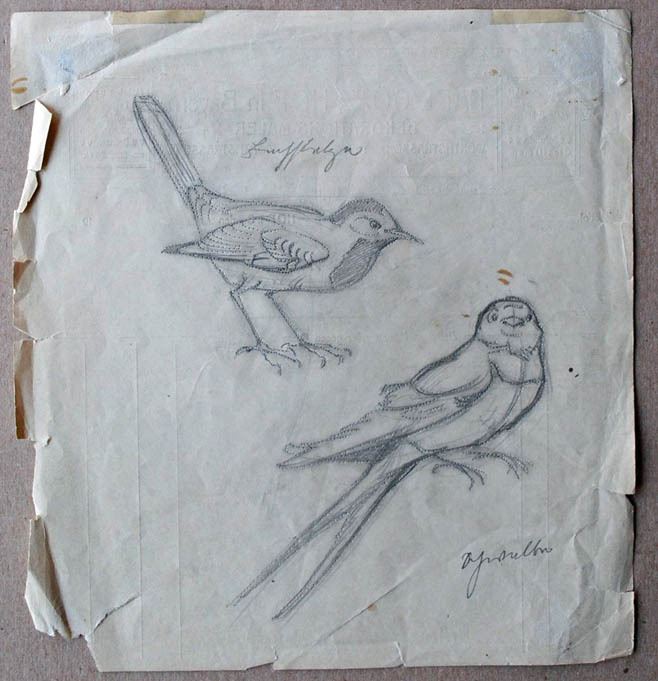 These weren’t labored over, they’re quickly sketched by someone who knows birds. You can see he’s familiar with bird anatomy and wing structure. 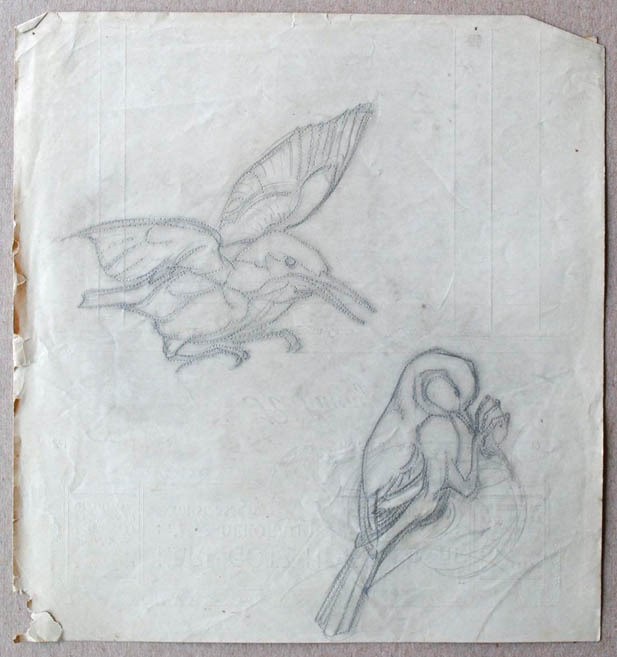 He’s drawn birds before and is proficient at capturing their gestures. This is the final sheet. It’s upside down to see the birds more easily. Again, drawn with skill and familiarity. Is it just a coincidence that these birds are here? Or is it a sign of a deeper interest? I’ll never know, but it sure makes me wonder. 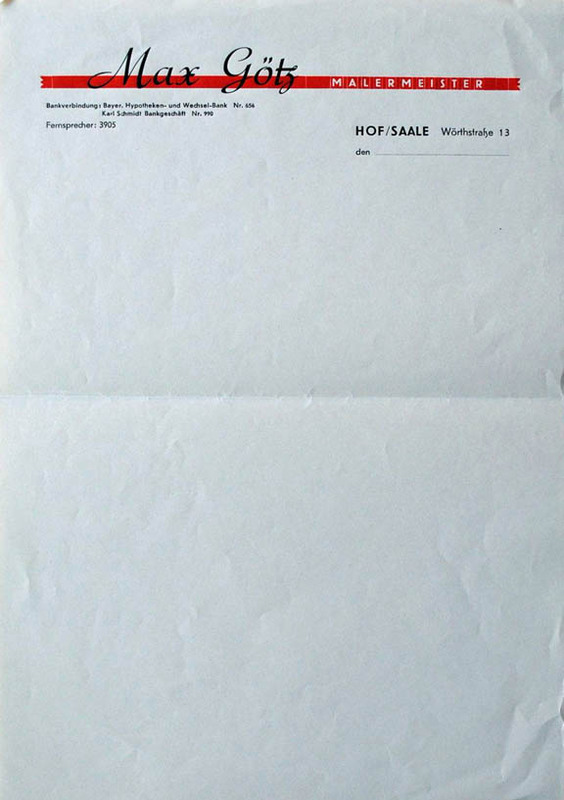 If you look at the invoices, you’ll see the the address on all of them is Wörthstrasse 13. 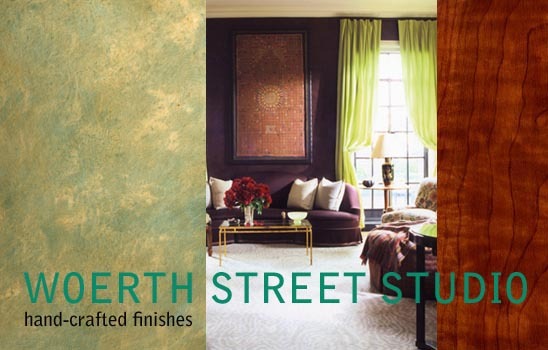 I named my company Woerth Street Studio to create a deliberate connection to the past. At the end of the day, though, I look at these papers and realize that the connections were there long before I recognized them. They draw the family together, creating links between us, yet at the same time, they extend far beyond us, forming bonds with others we already know or may never meet. 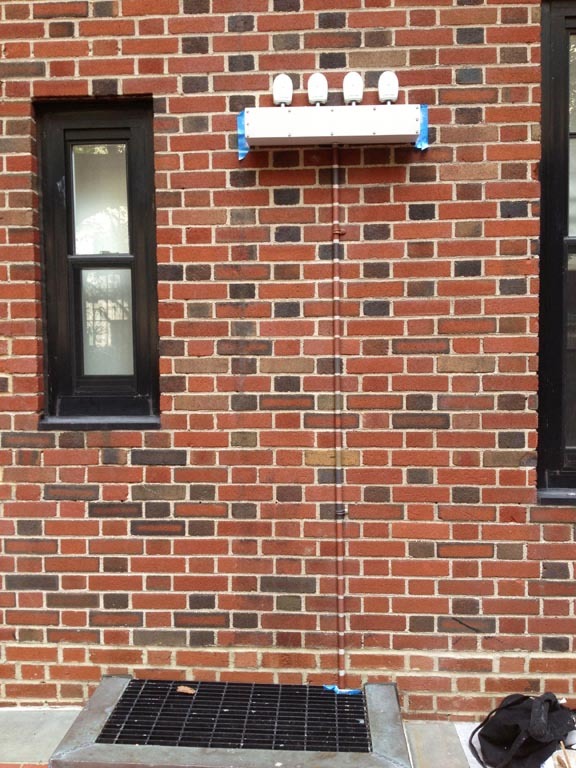 Apartment doors in New York City have to meet two criteria: they must be fireproof and self closing. A fireproof door can be either a kalamein door, which is wood wrapped in steel, or a hollow core steel door, which is found in newer construction. So no matter where you live, whether on Fifth Avenue or in a tenement building, your front door is made of steel. What does this have to do with painting wood, you ask? Lots! 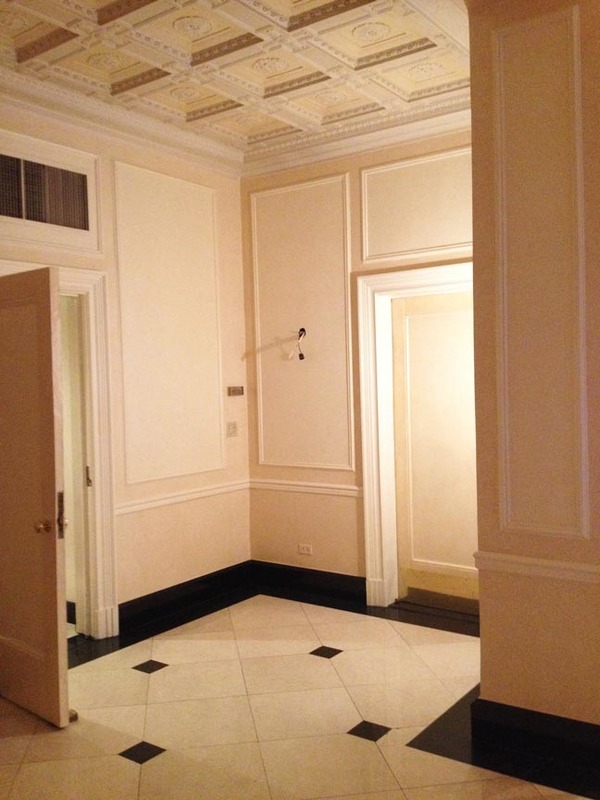 If you own a gorgeous apartment and your foyer is paneled in mahogany and furnished with all sorts of swanky stuff and your front door is ugly old steel, what do you do? 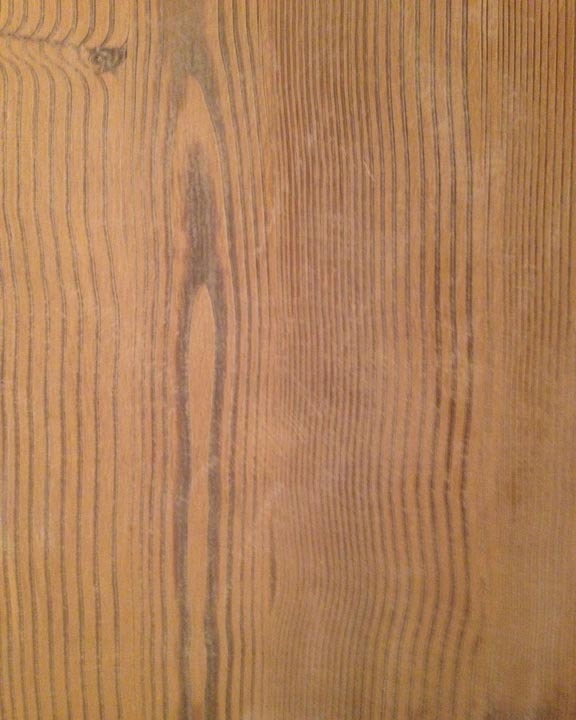 You paint your door to look like the wood in the rest of your foyer, that’s what. 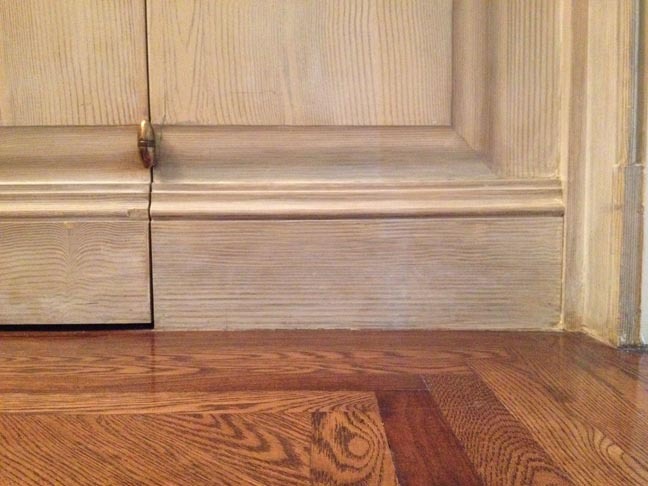 This door has been painted to look like mahogany. 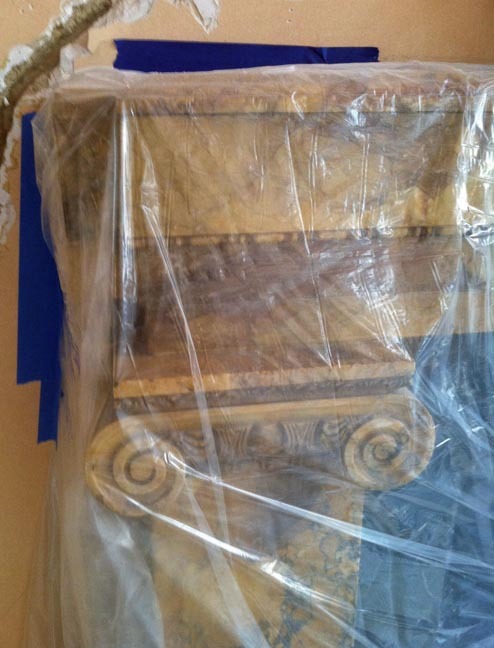 The molding is painted as well, to create a 3-D, or trompe l’oeil, effect. 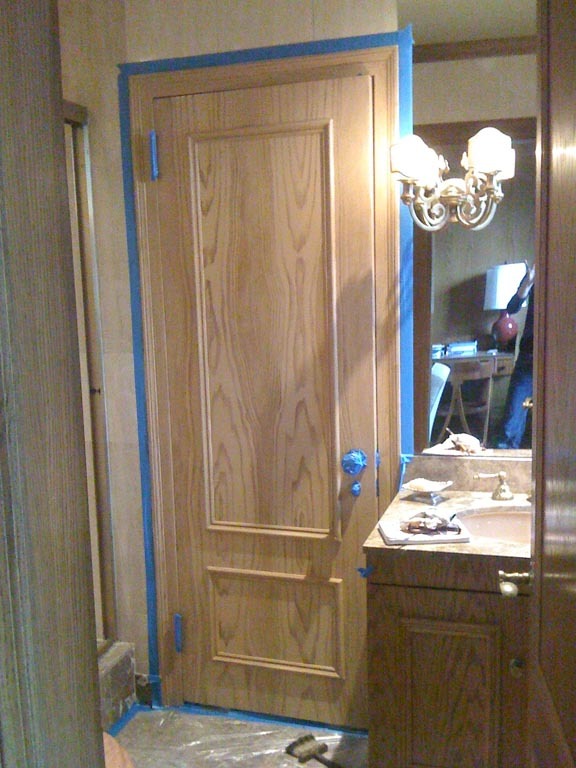 Painting doors as wood grain is one of my favorite projects, and has always been a steady source of work. No matter how much design trends come and go, a front door that’s made of wood (or appears to be) is always beautiful. 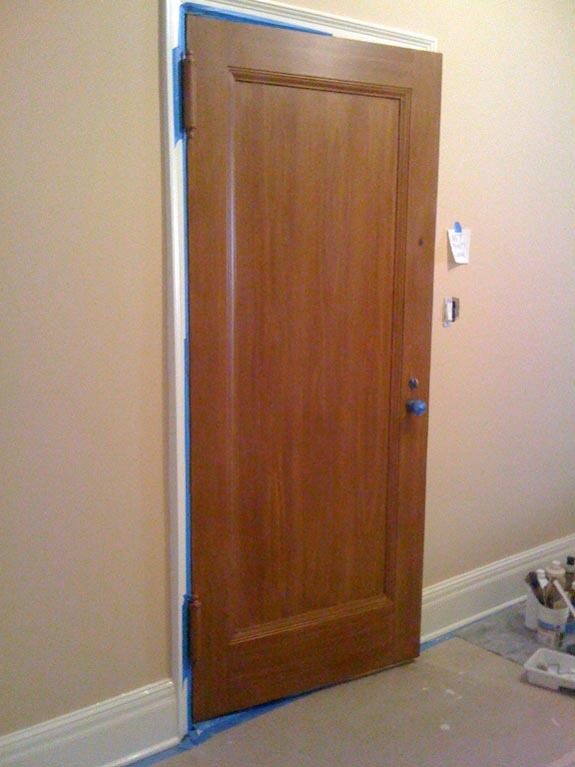 This door matches the simple wood closet doors in this entry foyer. 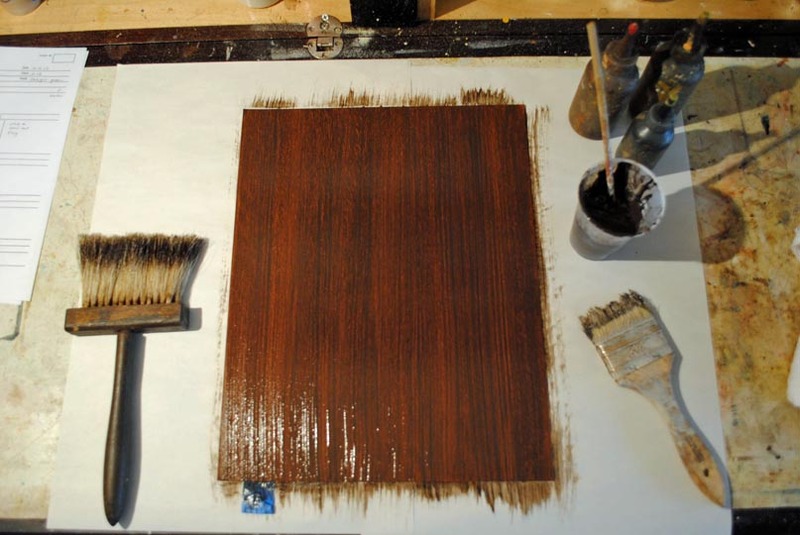 Painting wood seems complicated, but it’s actually not. It’s about two basic things, pattern and color, and once you understand how to see wood in this way, you can imitate almost any wood. 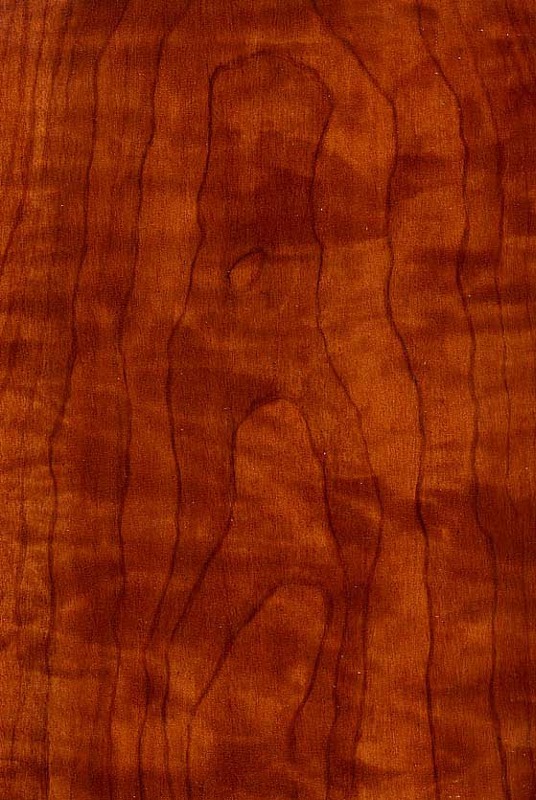 Most woods can be broken down into three layers: the flogging layer, which represents the pore structure, which are the tiny dots that are found in almost every wood; the figure grain, which is the pattern created by the sap; and the toning layer, which is the overall color of the wood. Each layer has a different color and pattern. 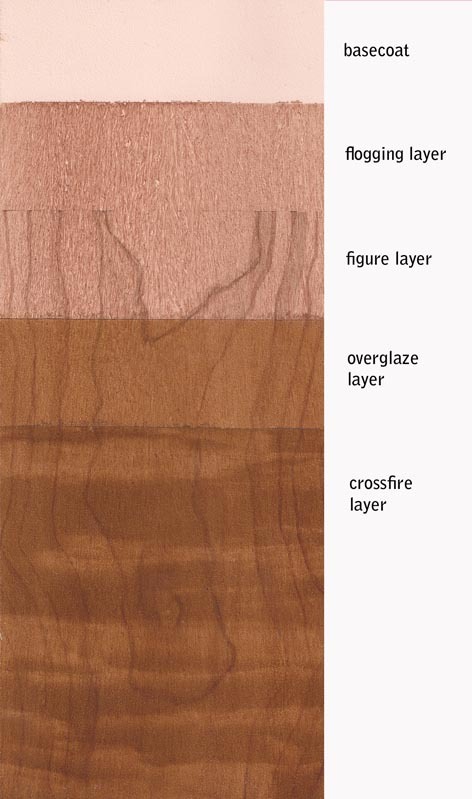 Therefore, if you can look at the real wood you’re matching and can recognize and visually separate the color and pattern of each of these layers, you can paint them. And if you’ve seen it all correctly, when the layers combine, voila! Wood. Obviously this takes a bit of practice, but once you get it, you’ve got it. 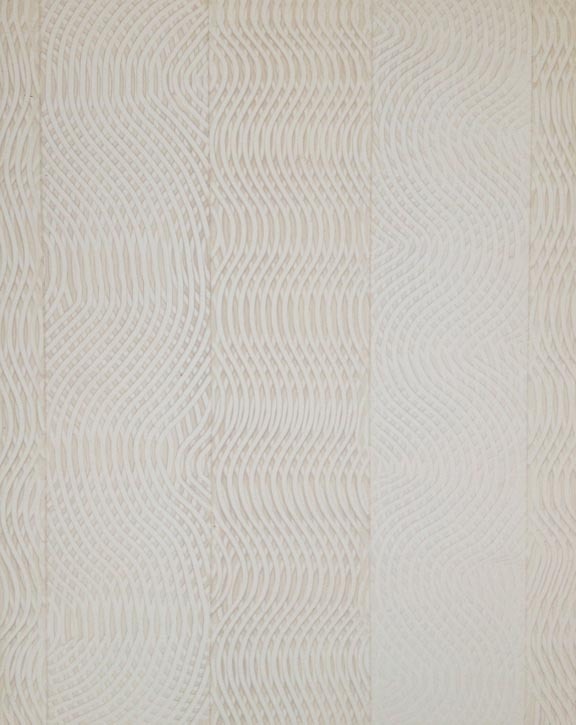 In this working sample, each layer was taped off after completion, so you can see how layers and color build up to create a pattern. In this sample, a fourth layer called the crossfire layer was added. 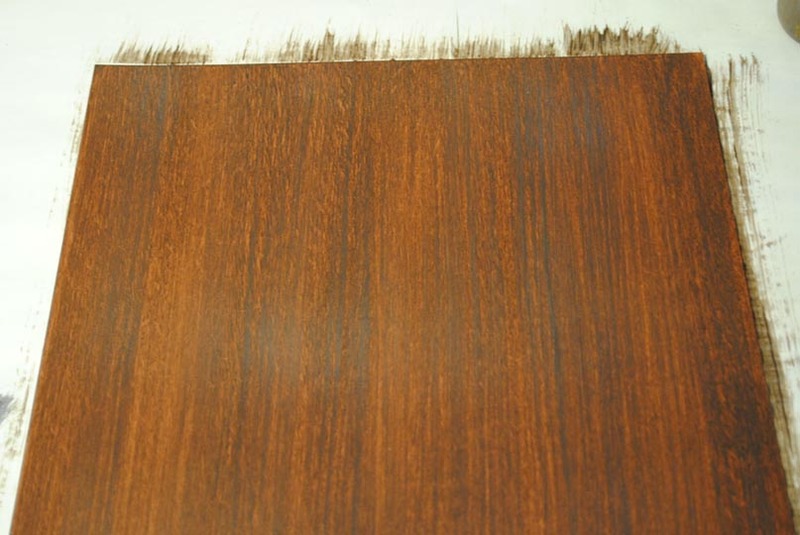 Notice the color of the base coat in relation to the final result. 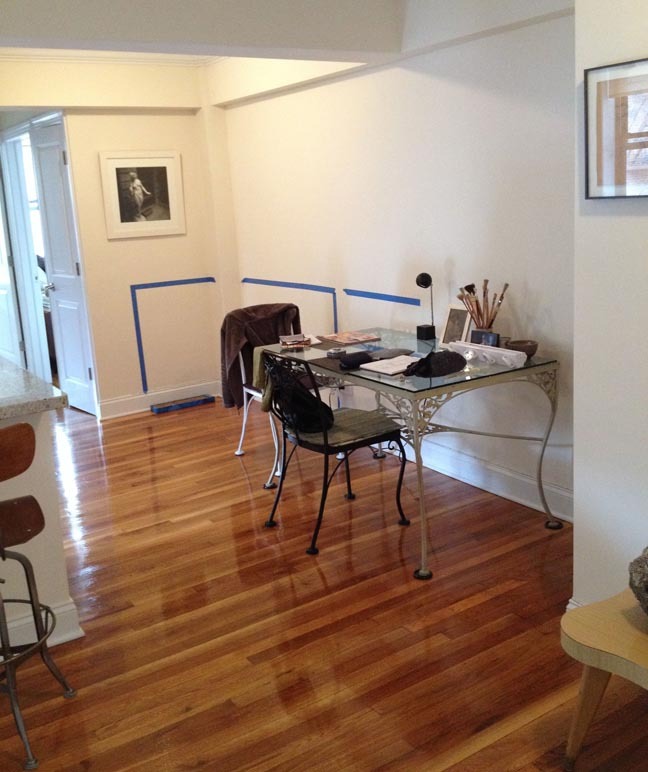 The base coat is always lighter than the final finish while tilting toward the wood’s deepest color. Most woods receive a final coat of varnish as well. 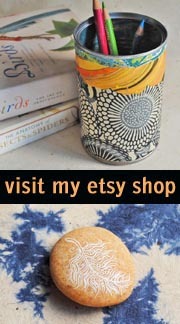 Each layer uses different brushes to create a specific pattern. 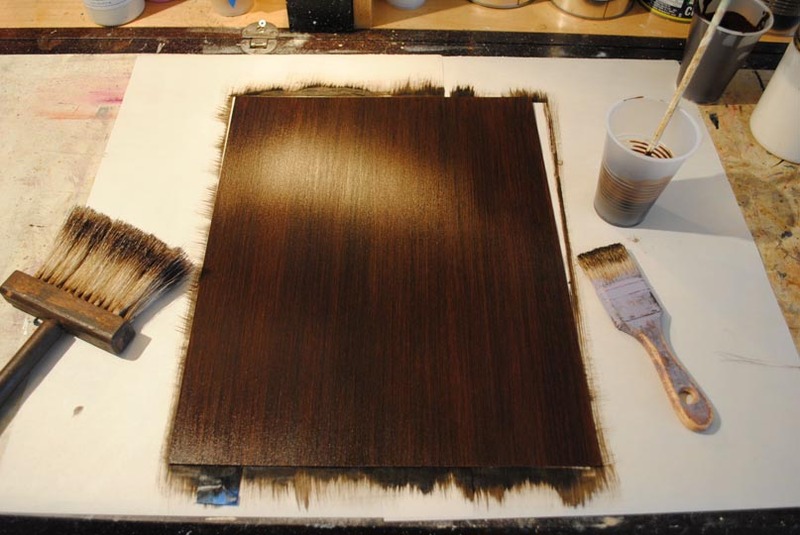 Here’s a quick sequence of the process of painting a dark straight grain mahogany. I paint wood grain using water-based glaze. 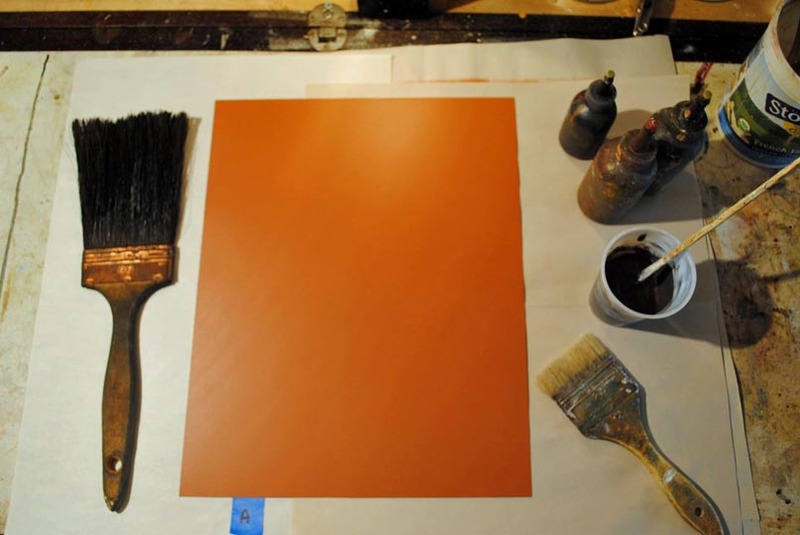 The sample board is painted in a terra cotta colored latex base coat. The glaze is applied with the chip brush on the right, then flogged with the flogging brush on the left. Next, the figure layer glaze is applied. In this case, the figure is a straight grain, so it’s a simple downward drag of the chip brush on the right. The pattern is softened with the badger brush on the left. The layer needs to dry before continuing. Finally, the overglaze of the toning layer. This is a dark one. 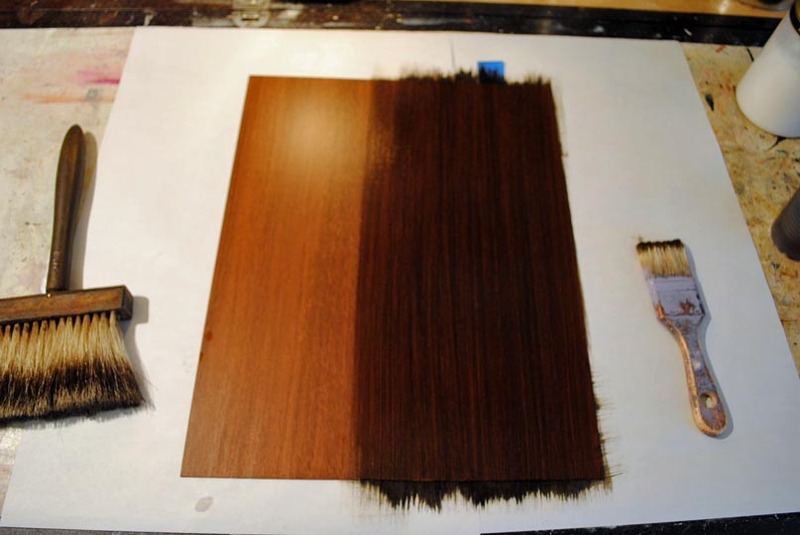 The base coat is much lighter so that there’s contrast between the colors, which helps the wood gain depth. 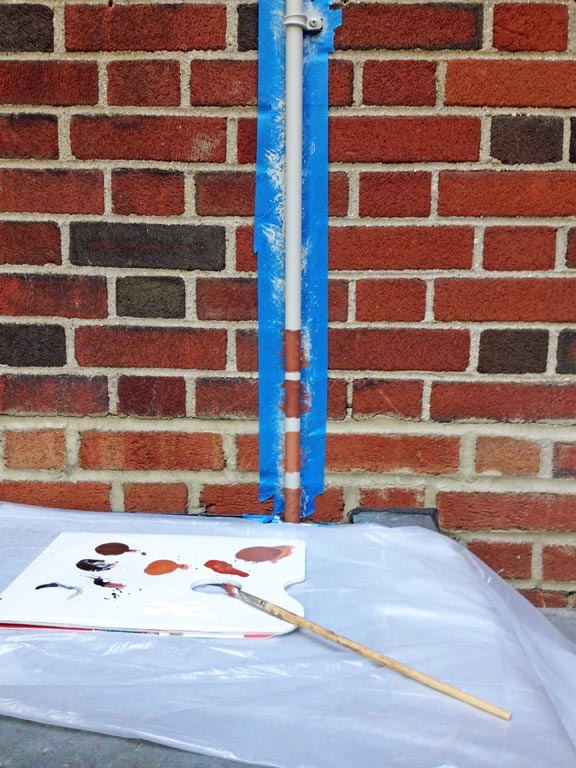 The overglaze is applied with a soft spalter brush. Again, the glaze is softened with the badger brush. 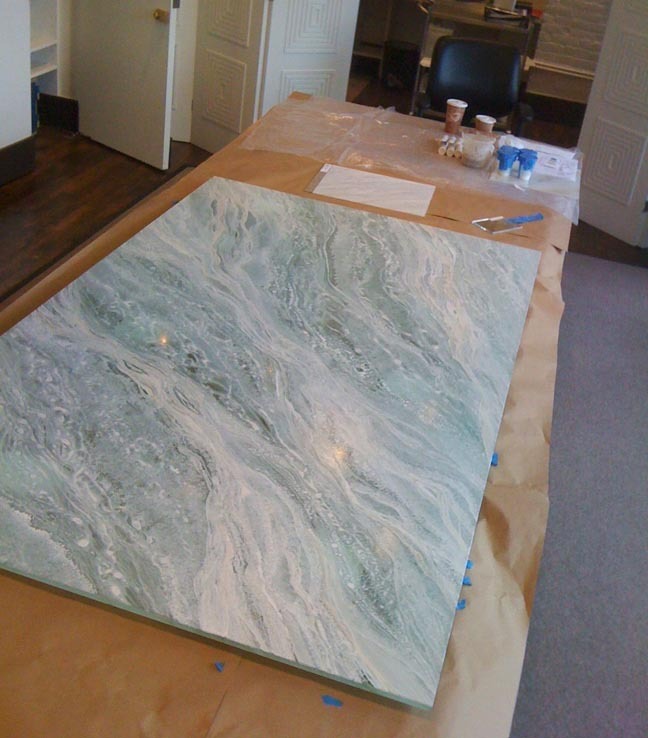 Once the glaze is dry, the surface is varnished with an oil-based satin varnish for more depth and protection. 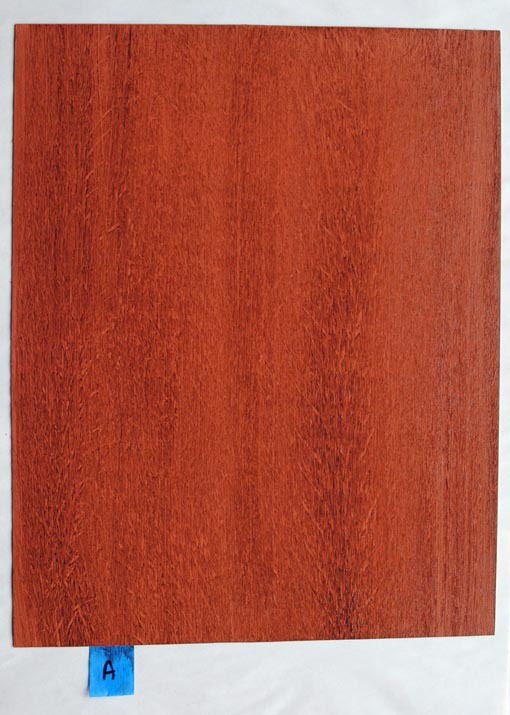 Here’s another straight grain mahogany in a redder version. 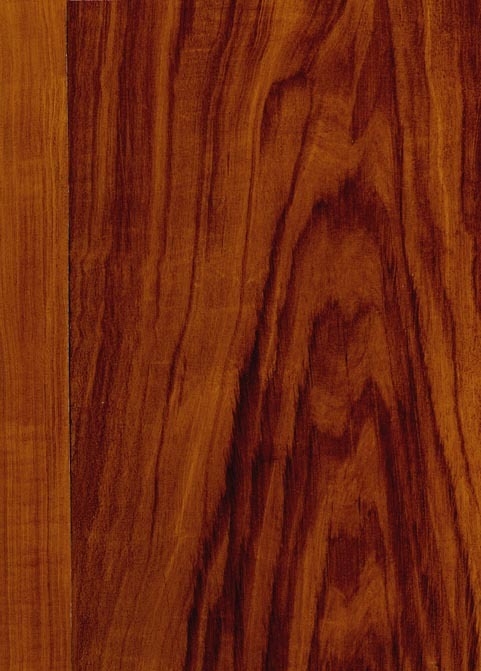 This is a sample of a browner mahogany figure grain. 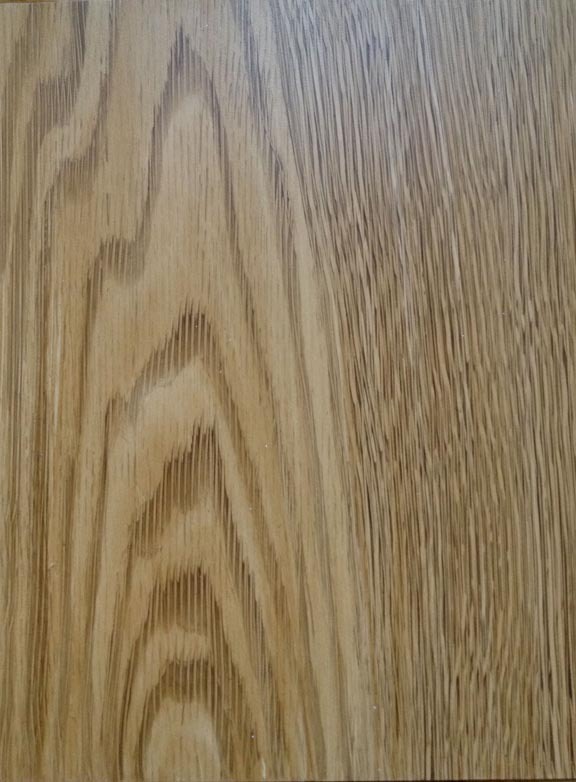 This wood is anigre. It’s painted with the fourth layer of crossfire over the toning layer. 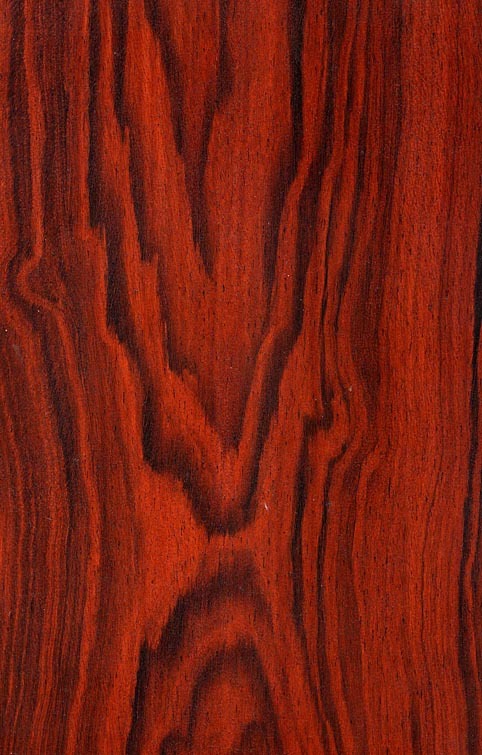 This is a close up of painted rosewood. 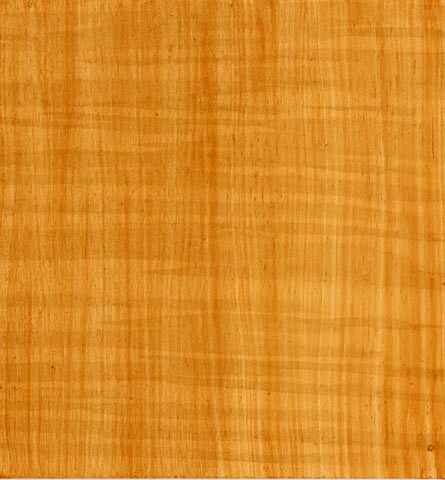 I love this wood, it’s so pretty. You can clearly see the specks of the pore structure here. 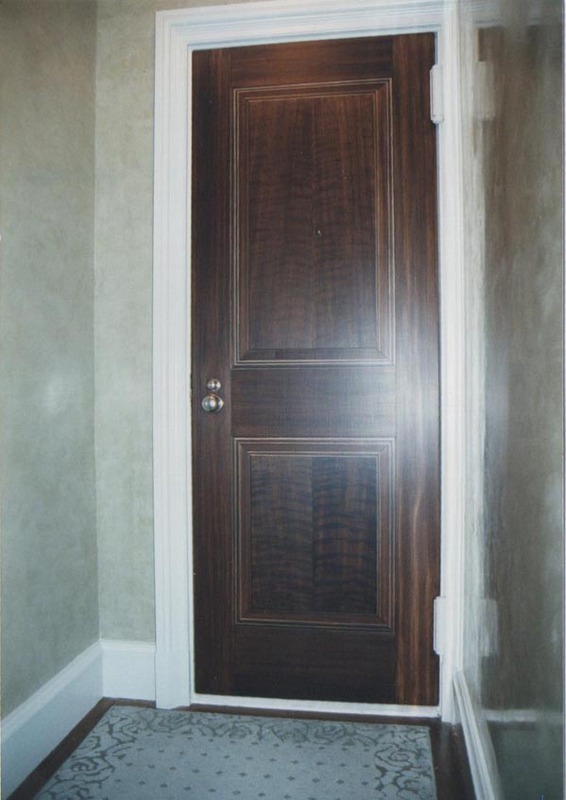 Wood doors are almost always painted to match other wood in the room and because of this, they are often assumed to be real. 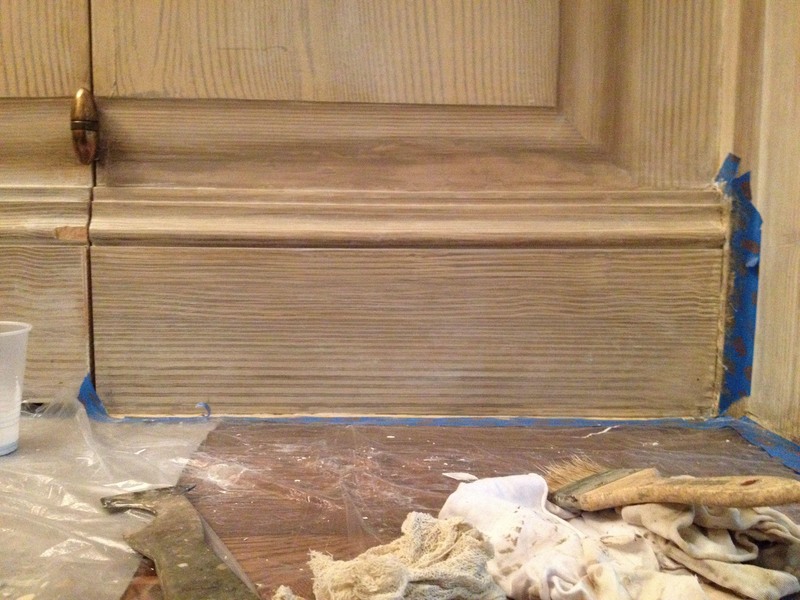 Sometimes faux wood molding is painted on as well, as shown in the first photo. 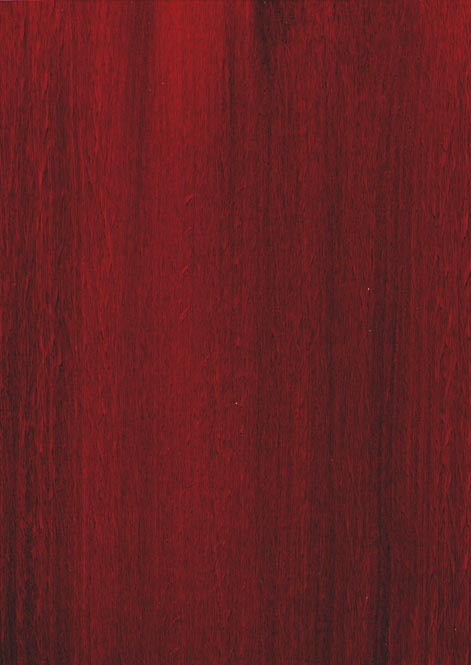 Painted wood grain will almost always be mistaken for real wood if it’s painted where one would expect to find real wood. 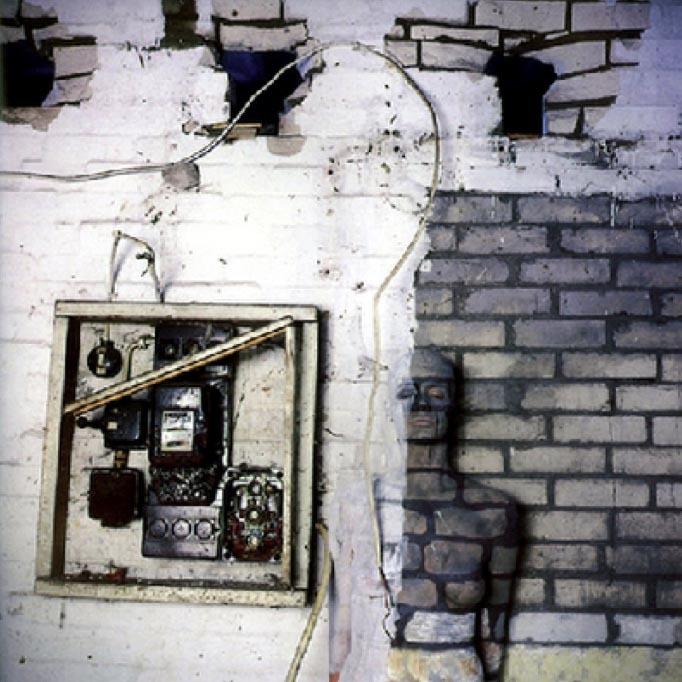 If you’d like to learn more about our lazy brains, it’s explained here in my post about trompe l’oeil. 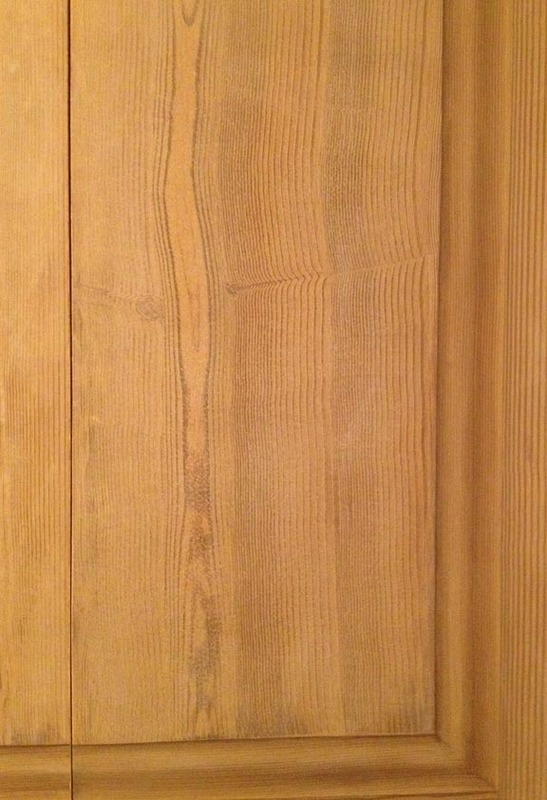 This is an interior door made of wood. Unfortunately, it was made of the wrong type of wood. 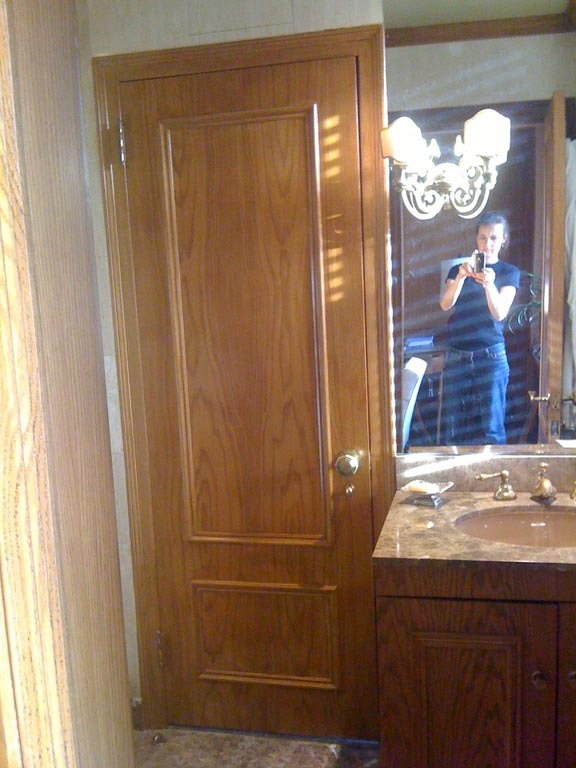 I painted it to match the surrounding oak cabinetry of the bathroom. Here you see the completed pore and figure layers. Here the door is complete, with the final toning layer and varnish. 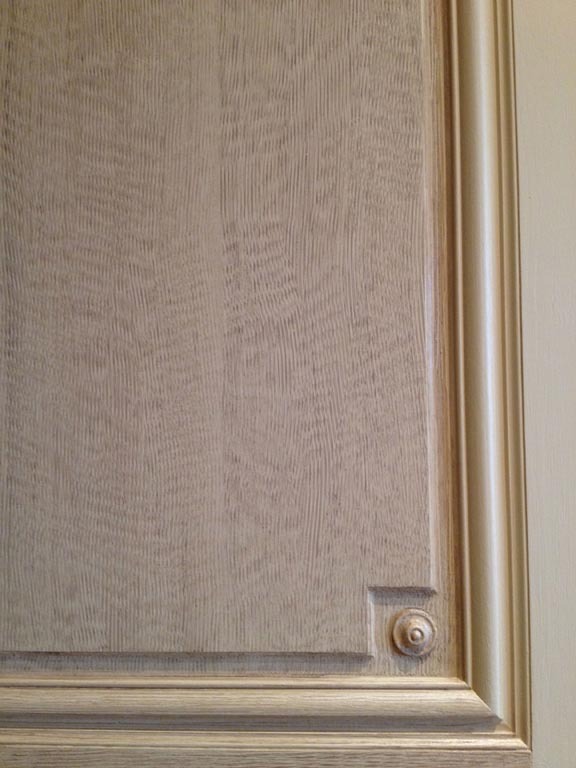 This is a close up of painted oak. If you live in an elevator building, the elevator doors are made of steel, too. If you’re lucky enough to have an elevator that opens directly into your apartment, then you may want those doors to match your foyer or entry vestibule as well. 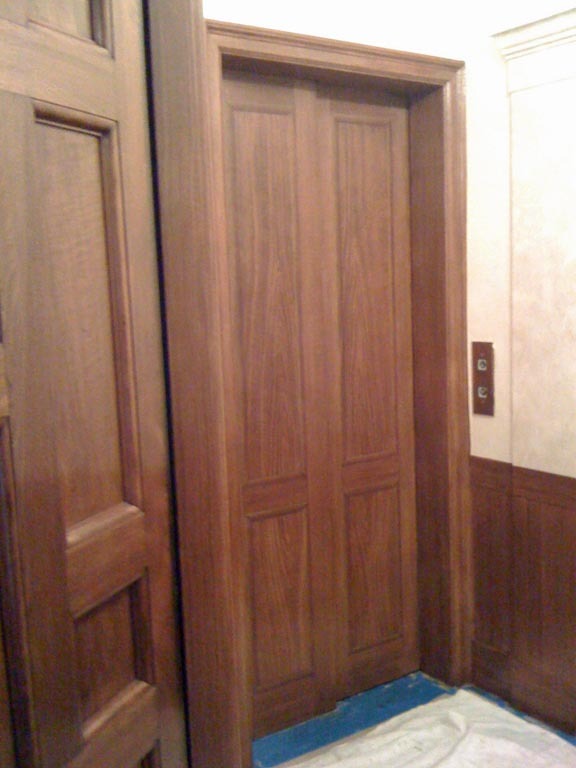 The real wood door is on the left; the painted elevator doors, with faux moldings, on the right. 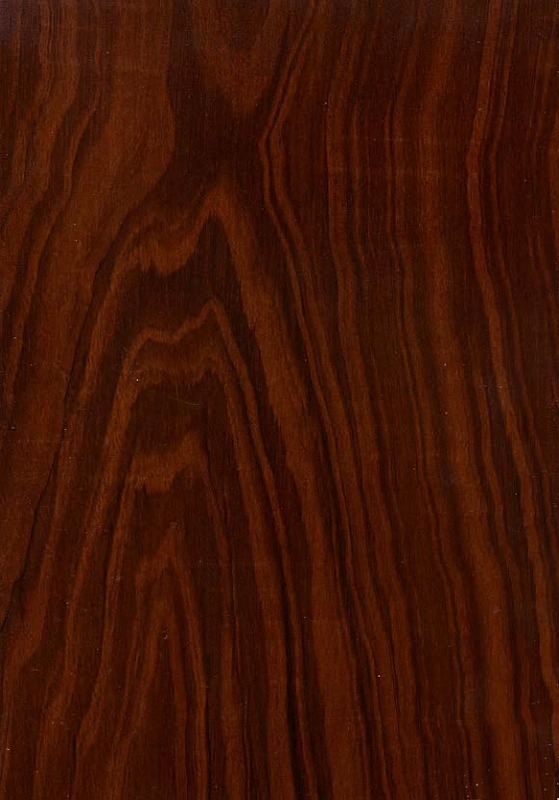 So the next time you’re in New York, standing in front of an elevator door or an apartment door and you think you’re looking at real wood, look again… you may be wrong!